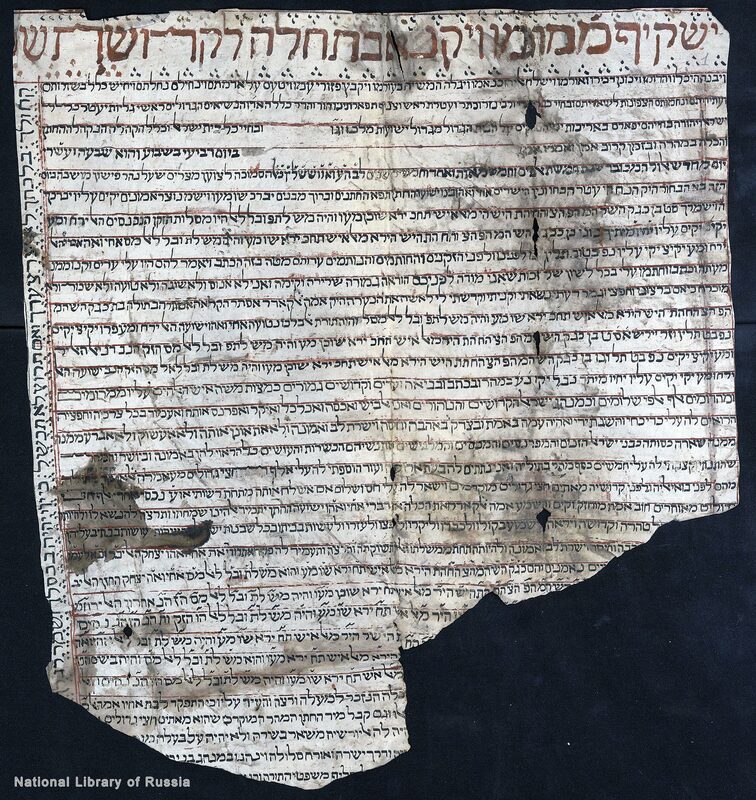 Marriage contract between the Head of the Karaites of Egypt (ha-Nasi ha-Gadol) Solomon ben David ben Ele‘azar, son of Uzziiah, and Sathit bat … ben Avraham. 1678 AG (Seleucid era) /1367 AD (Christian era), Cairo. Oriental handwriting. 1 fol. Paper. 56 х40 cm. 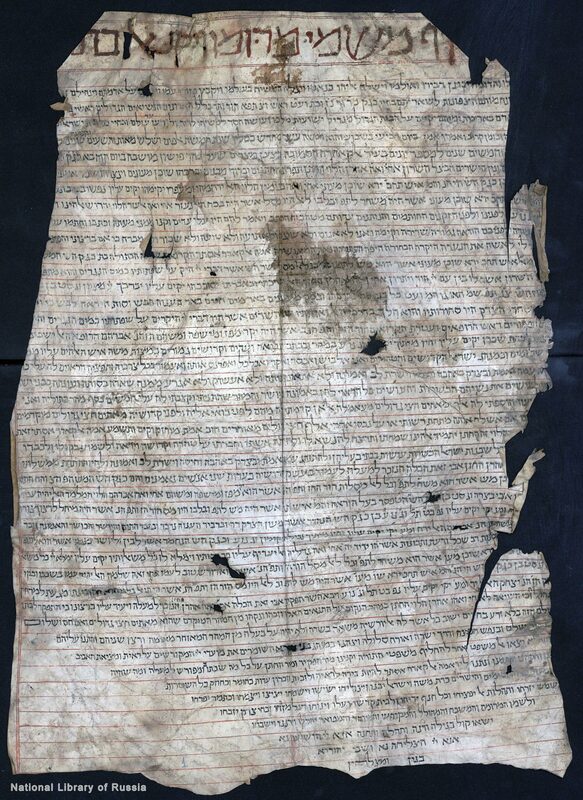 The document was pasted on the reverse side of the contract of 1713 AD (No. 25). 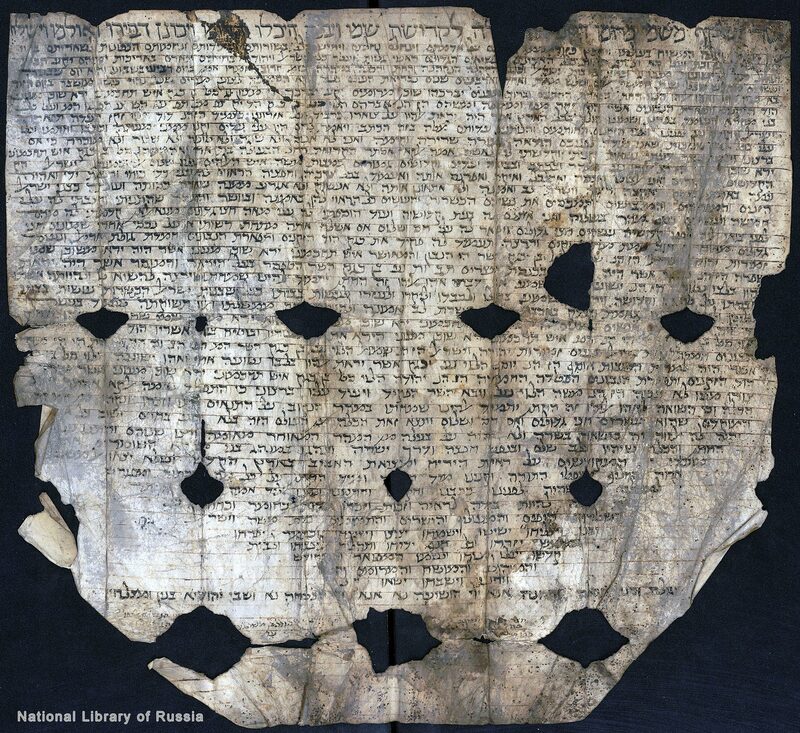 Marriage contract of Avraham ben Shemuel with Hass bat … Fragment (the beginning of the document). 1764 AG /1453 AD, Cairo. Square hand script. 1 fol. Parchment. 37 х50 cm. The opening words are written larger in gold paint. The contract is decorated with a frame. On the back of the document are notes and scratchs of the pen. 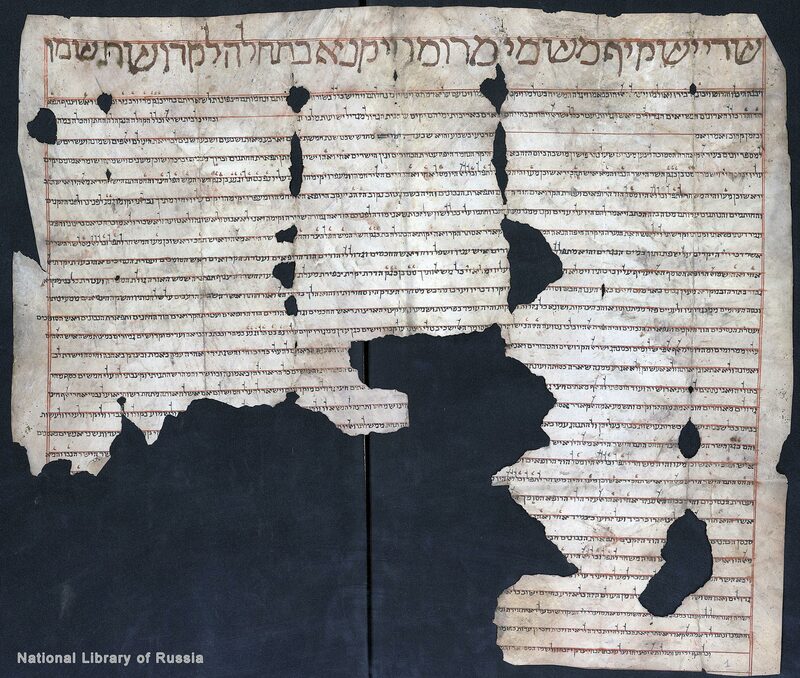 Marriage contract between Yeshua ben Ele‘azar ben Avraham and Sathit bat Joseph ha-Kohen ben Avraham ha-Kohen. 1810 AG /1499 AD, Cairo. Square hand script. 1 fol. Parchment. 49 х53 cm. The document has the form of a trapezoid. 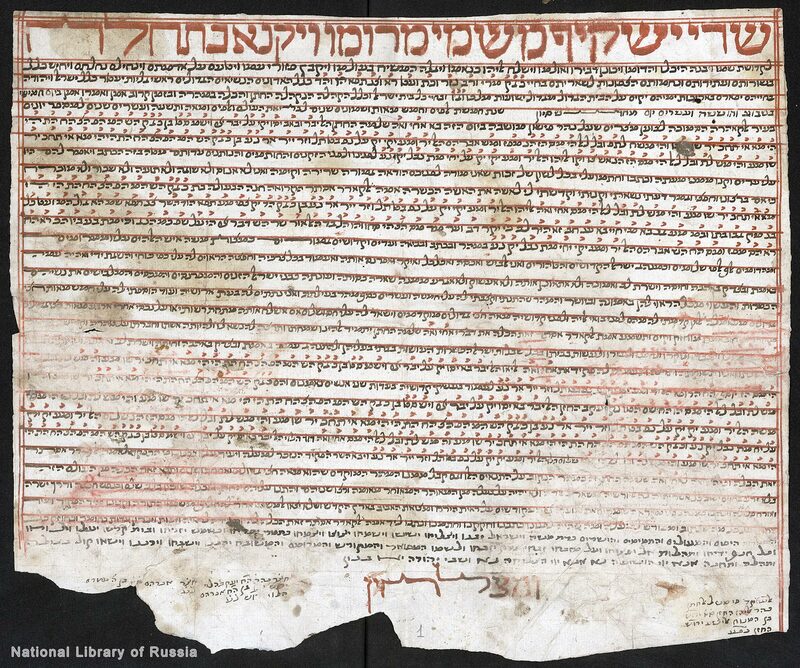 The parchment is ruled using black ink in the right margin and red ink (visible only in the lower field). The sheet is damaged on the left side and at the folds. 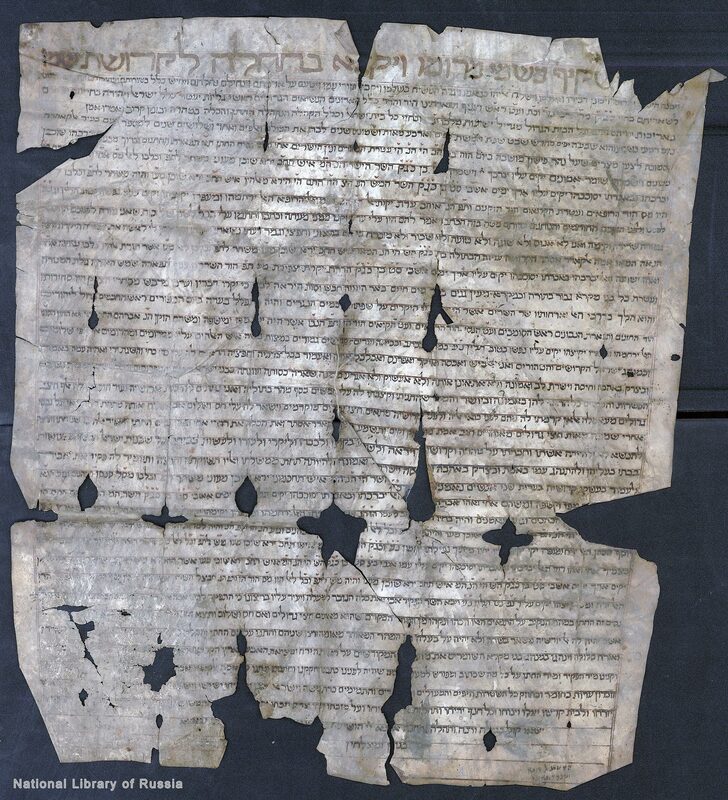 Marriage contract between the Karaite David ben Elijah ben Aharon and the Karaite Fadl al-Jalil ben Joseph, Hazzan, son of Aharon, the main Hazzan. Fragment. 1830 AG /1519 AD. Square hand script. Signatures of witnesses are in Arabic. The left side of the sheet is torn off. Marriage contract between the Karaite Jehuda ben Chaim ben Joseph ha-Rofeh with Gita bat Aharon. 1831 AG /1520 AD Cairo. Square hand script. 1 fol. Parchment. 48,5 х57 cm. The parchment is ruled using red ink. The back of the sheet contains the date of the document, written in blue pencil. The lower side of the sheet is torn off, there are dirty spots. 5333 AM (year after the creation of the world) /1573 AD Cairo. Karaite oriental handwriting. 1 fol. Parchment. 60 х46 cm. The sheet is torn off. Marriage contract between David ha-Levi ben Avraham ha-Levi, son David ha-Levi, and Rachel bat Aharon Elijah. 5341 AM (year after the creation of the world) /1581 AD Cairo. Karaite oriental large handwriting, similar to the square hand script. 1 fol. Parchment. 44 х46,5 cm. 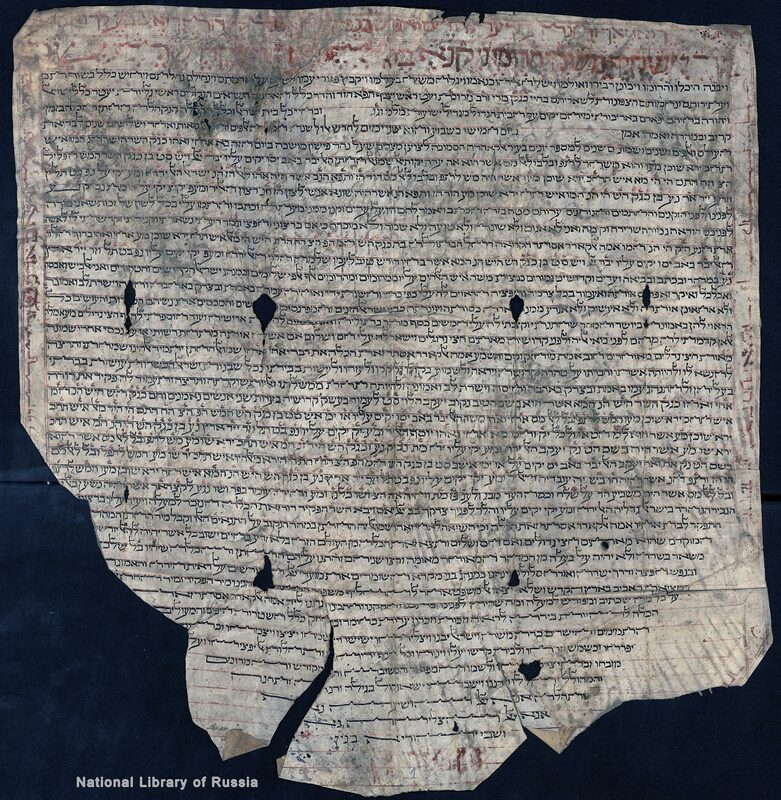 The document has a hexagon shape (perhaps the bottom corners are cut away). The parchment is ruled using red ink. The back of the sheet contains the date of the document, written in blue pencil. The sheet is damaged at the folds. Marriage contract between the Karaite Ja‘cob ben Moshe ben Aharon and … bat Solomon ben Isaac. 5388 AM (year after the creation of the world) /1938 AG /1627 AD Cairo. Square hand script. Signatures of witnesses are in Arabic and Hebrew. 1 fol. Parchment. 65 х45 cm. Ruled using red ink. The back of the sheet contains the date of the document, written in blue pencil. The sheet is with ragged edges, the bottom left corner is cut off, there are dirty spots on the left side of the sheet. 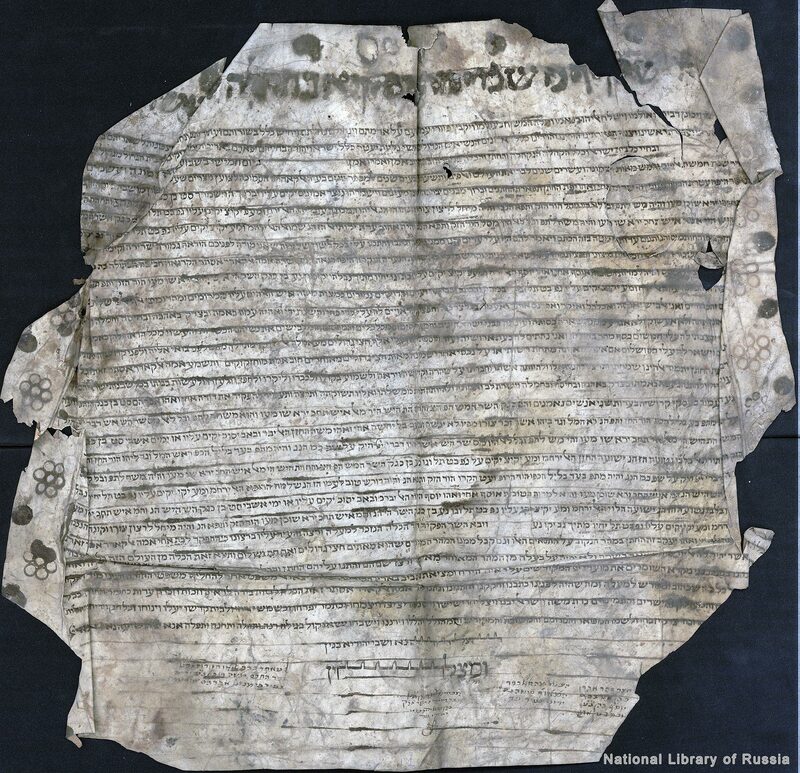 Marriage contract between Joseph ha-Levi ben Jehuda ha-Levi, son Obadiah ha-Levi, and Zubaydah bat Obadiah ben David. 5399 AM (year after the creation of the world) /1950 AG /1639 AD, Damascus. Square hand script. Signatures of witnesses are in Arabic. 1 fol. Parchment. 66 х61 cm. 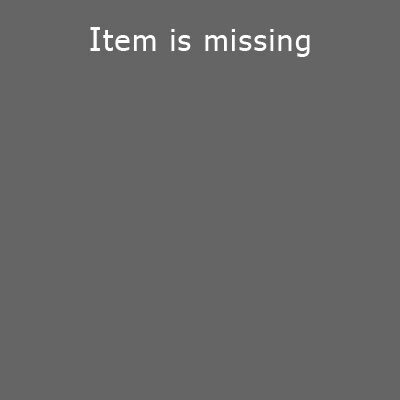 The document has the form of a trapezoid (or hexagon). Ruled using black ink. The top line is outlined in red. The back of the sheet contains the date of the document, written in blue pencil. The upper and lower parts of the sheet are significantly damaged, the bottom corners are cut off unevenly. 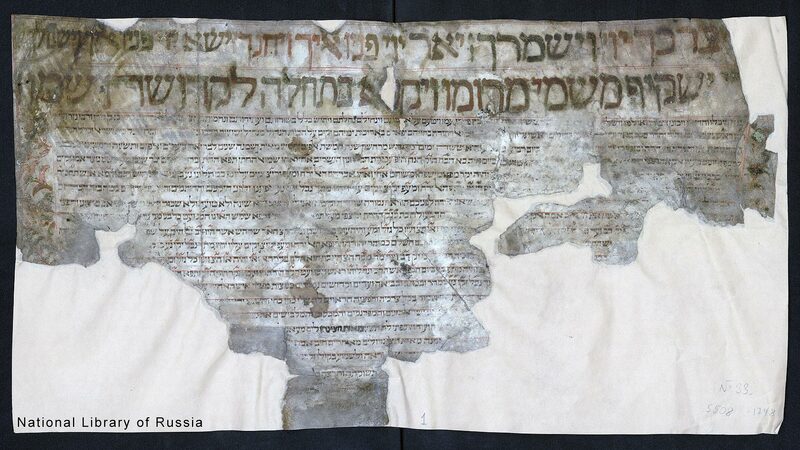 Marriage contract between the Karaite Aharon ha-Levi ben Benjamin ha-Levi ben Ele‘azar ha-Levi с Sarah (?) bat Aharon Hazzan, ben Avraham Rofeh. 5399 AM (year after the creation of the world) /1639 AD Cairo. Square hand script. 1 fol. Parchment. 61,7 х46 cm. Ruled using red ink. The side edges of the sheet are damaged, there are dirty spots. 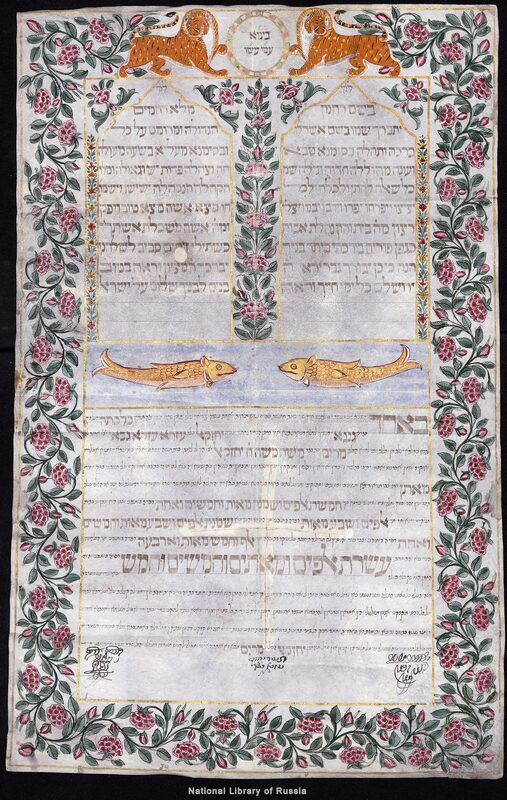 Marriage contract between the Karaite Joshu‘a ben Mordechai ben Pinchas ha-Rofeh and Sathit bat Shemu’el ha-Rofeh ben Avraham ha-Rofeh. 5400 AM (year after the creation of the world) /1949 AG /1639 AD Cairo. Draft copy. Square hand script. Additions are made in a Karaite oriental handwriting. 2 fols. (a double sheet). Paper. 31,5 х21,7 cm. The back of 2v folio contains the date of the document, written in blue pencil. The bottom part of the leaf is damaged at the fold, there are ink smudges. The sheet is torn at the fold. 5400 AM (year after the creation of the world) /1640 AD Cairo. Square hand script. Signatures of witnesses are in Arabic. 1 fol. Parchment. 53 х49 cm. The parchment is ruled with red ink, the top line is also written in red. The back of the sheet contains the date of the document, written in blue pencil. The leaf is torn off, the names of the groom, of the bride's father and grandfather are missing. Marriage contract between the Karaite Avraham ben Jehuda ben Avraham and Aziza bat Aharon ha-Rofeh ben Ele‘azar ha-Rofeh, Hazzan. 5405 AM (year after the creation of the world) /1956 AG /1645 AD Cairo. Square hand script. 1 fol. Parchment. 48 х74 cm. The document has the form of a trapezoid. The parchment is ruled with red ink, the opening line is also written in red. The reverse side of the contract carries an unusual note - a confirmation of the groom that his bride was a virgin, written in a semi-italic hand in Cairo, - and the date of the document, written in blue pencil. The lower side of the sheet is torn off. The leaf is damaged in the upper part and at the folds, there are dirty spots. Marriage contract between the Karaite Aharon, Hazzan, ben Ele‘azar, ha-Rofeh, ben Aharon, ha-Rofeh, and Sultana bat Solomon ben Joseph, Hazzan. 5416 AM (year after the creation of the world) /1656 AD Cairo. Scribe Aharon Mi‘mar. Karaite oriental handwriting. 1 fol. Parchment. 95 х56 cm. 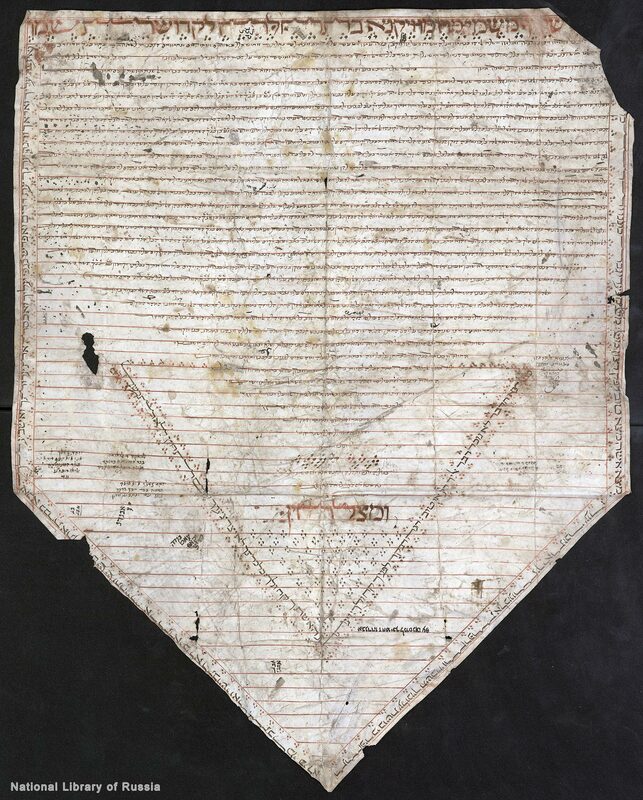 The document has the complex form of a pentagon resembling an upright elongated triangle with an acute lower end-cone. The parchment is ruled with red ink, the head line is also written in red. The leaf is damaged in the left part and at the folds. Marriage contract between the Karaite Aharon ben Ja‘cob ben Avraham and Rahma bat Gedaliah ben Solomon. Fragment. 5418 AM (year after the creation of the world) /1658 AD Cairo. Square hand script. Signatures of witnesses are in Arabic. 1 fol. Parchment. 59,5 х50 cm. The parchment is ruled with red ink, the head line is also written in red. The back of the sheet contains the date of the document, written in blue pencil. 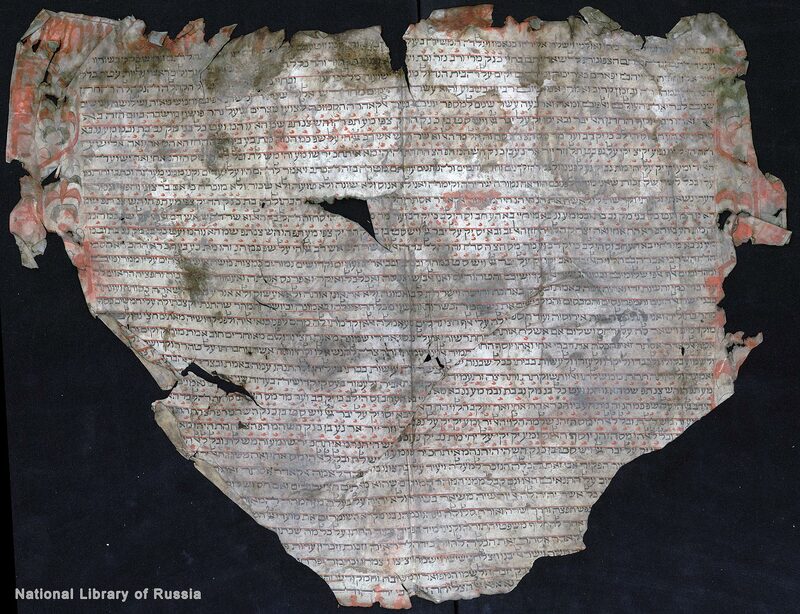 The right part of the sheet is torn off, more than a quarter of the text is missing, there are dirty spots. 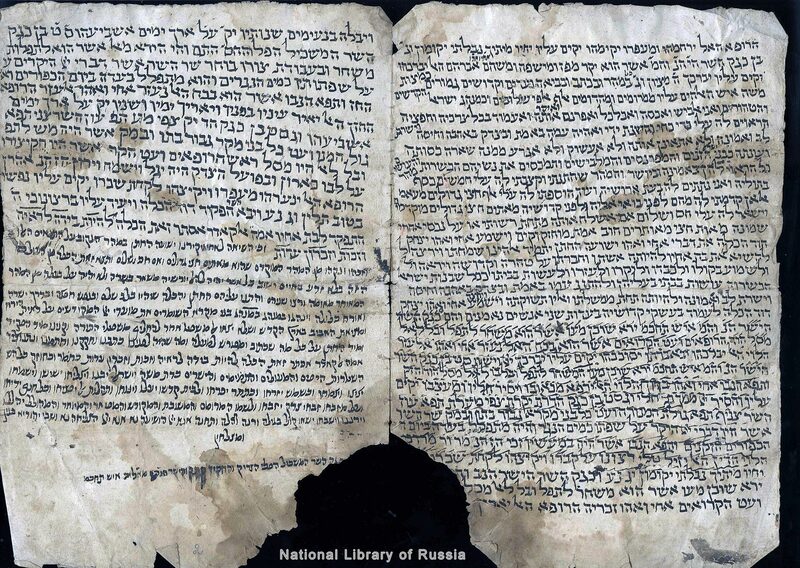 Marriage contract between the Karaite Joseph ben Shemu’el ben Obadiah and Tamma bat Avraham ha-Levi ben Moshe ha-Levi. 5426 AM (year after the creation of the world) / 16 AG /1665 AD Cairo. Square hand script. 1 fol. Parchment. 42 х70 cm. There is a frame, the parchment is ruled. Marriage contract between the Karaite Aharon ben Ele‘azar ben Aharon and Tarafa bat Mordechai, ha-Rofeh, ben Ele‘azar, ha-Rofeh. 1 fol. Parchment. 54 х60 cm. The right part of the sheet is torn off. Marriage contract between the Karaite Dani’el ben Joseph ben Solomon, Hazzan, and Faraj bat Joshu‘a ben Isaac. 5435 AM (year after the creation of the world) /1986 AG /1675 AD Cairo. 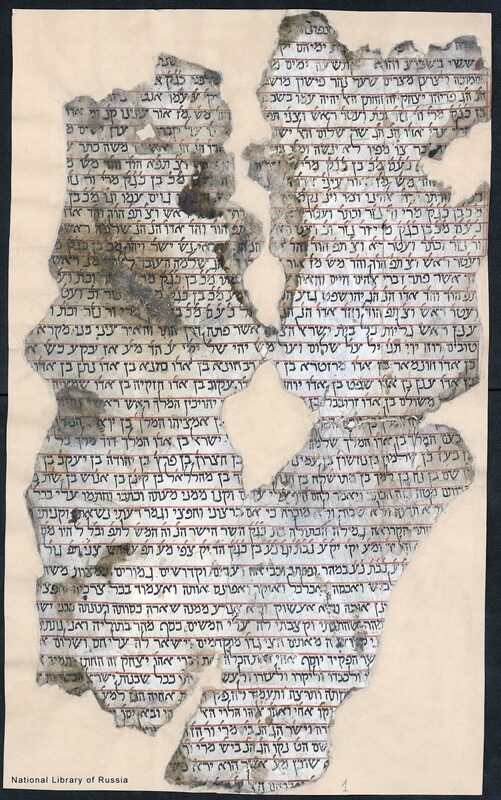 Scribe Baruch Rofeh. Square hand script. 1 fol. Parchment. 80 х54,5 cm. The document has the form of a pentagon с with a narrow bottom corner. The parchment is ruled with red ink, the head line is also written in red. The back of the sheet contains the date of the document, written in blue pencil. 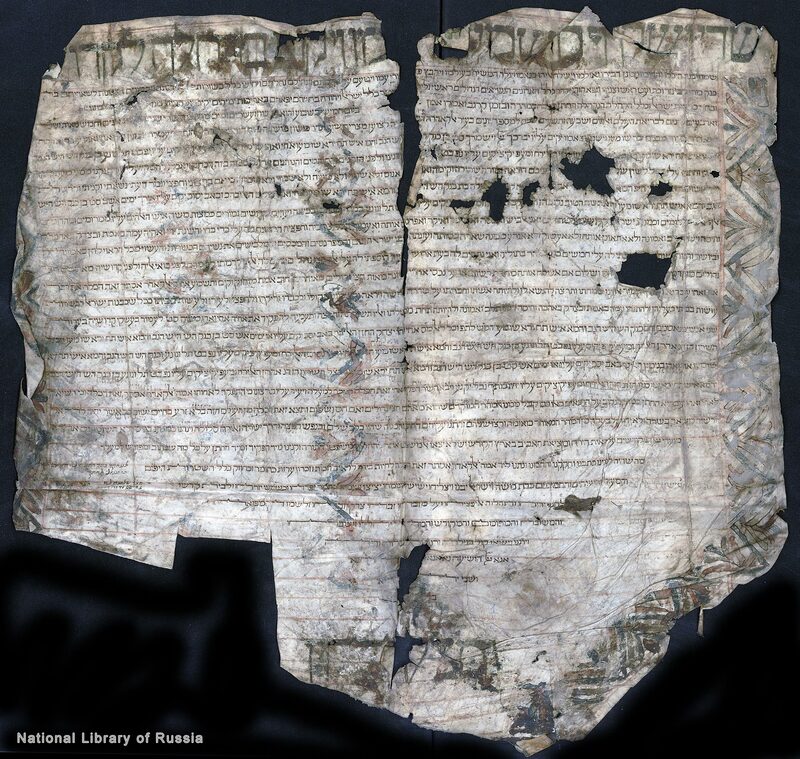 The parchment is slightly damaged on the edges and at the folds. Marriage contract between the Karaite Isaac ha-Levi ben … ben Obadiah ha-Levi and Makhza bat … ben Isaac ha-Levi. 1997 AG /1686 AD Cairo. 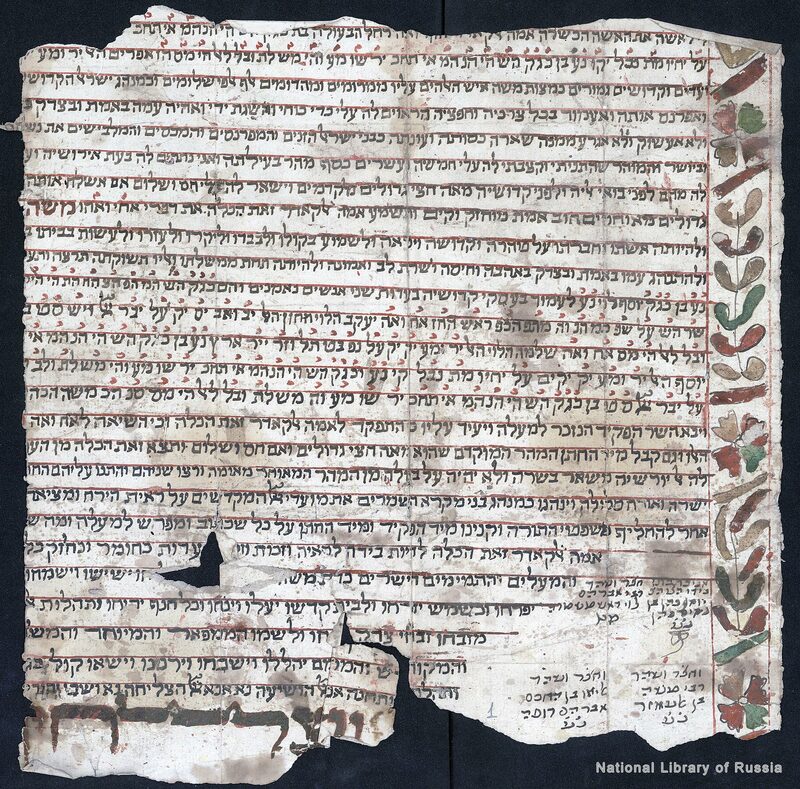 Scribe Baruch Rofeh. Karaite oriental handwriting. 1 fol. Parchment. 56 х55,5 cm. Ruled using red ink. The back of the sheet contains the date of the document, written in blue pencil. 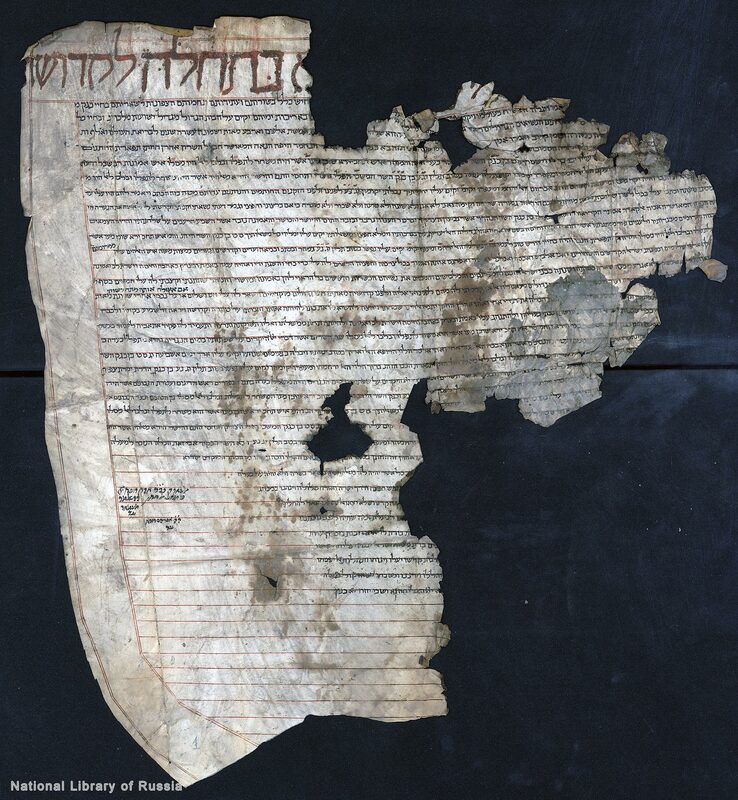 The upper part of the sheet is torn off, the parchment is damaged at the folds. Marriage contract between the Karaite Ele‘azar ben Aharon ben Ja‘cob and Sarah bat Elish, ha-Rofeh, ben Joshu‘a, ha-Rofeh. 5453 AM (year after the creation of the world) /2004 AG /1693 AD Cairo. Square hand script. 1 fol. Parchment. 67,5 х57,5 cm. The document originally has the form of a pentagon. Ruled using red ink. The back of the sheet contains the date of the document, written in blue pencil. The leaf is torn off at the top and bottom, there is a cut on the right, there are dirty spots. Marriage contract between the Karaite Mordechai ben Avraham (ha-Rofeh) ben Jehuda and Esther bat David ben Moshe (ha-Rofeh). 5458 AM (year after the creation of the world) /2008 AG /1798 AD Cairo. 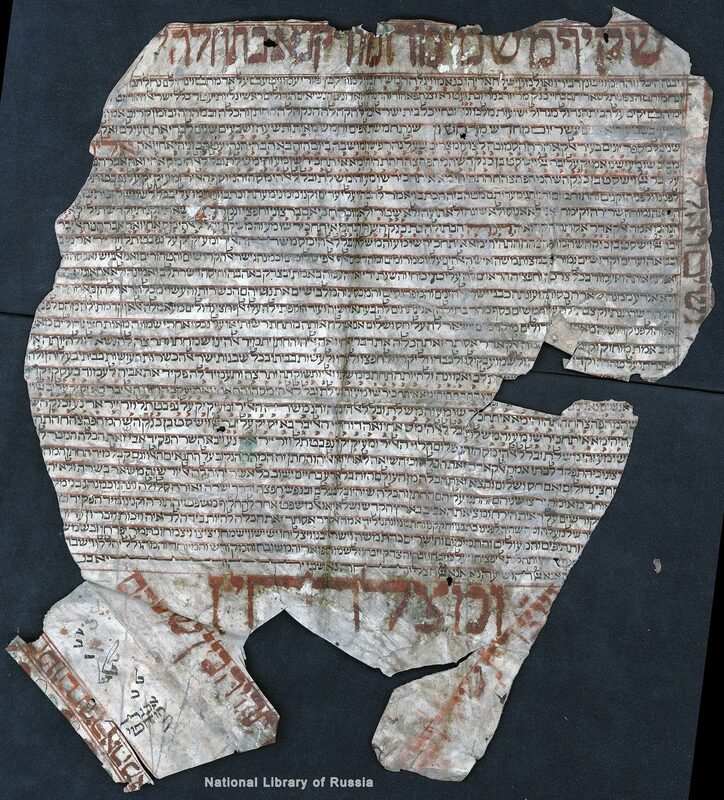 Scribe Baruch Rofeh. Square hand script and Karaite oriental handwrighting in some places. 1 fol. Parchment. 76 х57,6 cm. The document has the form of a pentagon. Ruled using red ink. The back of the sheet contains the date of the document, written in blue pencil. 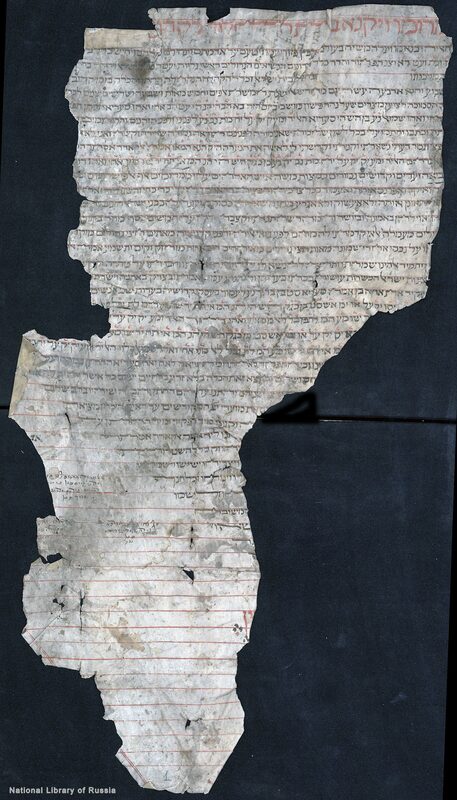 The parchment is slightly damaged. There are dirty spots. Marriage contract between the Karaite Joshu‘a ben Joseph ben Solomon and Rahama bat Joseph ben Isaac ha-Levi. 54 AM (year after the creation of the world) /2016 AG /1705 AD Cairo. Square hand script. 1 fol. Parchment. 53 х55 cm. The head line is written in red. The parchment is ruled using black ink. The back of the sheet contains the date of the document, written in blue pencil. The lower part of the sheet is torn off. 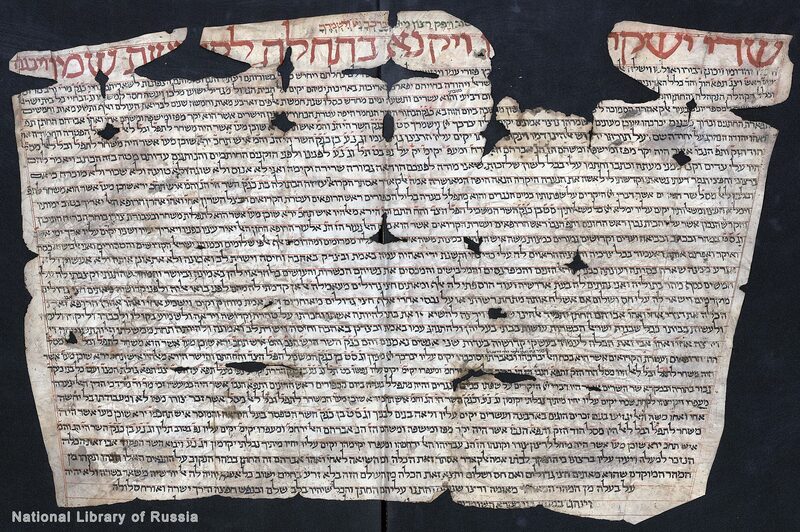 Marriage contract between the Karaite Avraham ha-Kohen ben Solomon ha-Kohen с Aziza bat Shemu’el ha-Levi ben Moshe ha-Levi. 5471 AM (year after the creation of the world) /2021 AG /1710 AD Cairo. Square hand script. 1 fol. Parchment. 46 х63 cm. The parchment is ruled using black ink. The back of the sheet contains the date of the document, written in blue pencil. The lower part of the leaf is slightly torn off, there are dirty spots. Marriage contract between the Karaite Zechariah ben Ratzon, ha-Rofeh, ben Aharon, ha-Rofeh, and Sitt al-Beyt bat Ja‘cob ben Solomon. 1 fol. Parchment. 53 х60 cm. The head line is also written in green (copper oxides?). Ruled using red ink. The back of the sheet contains the date of the document, written in blue pencil. 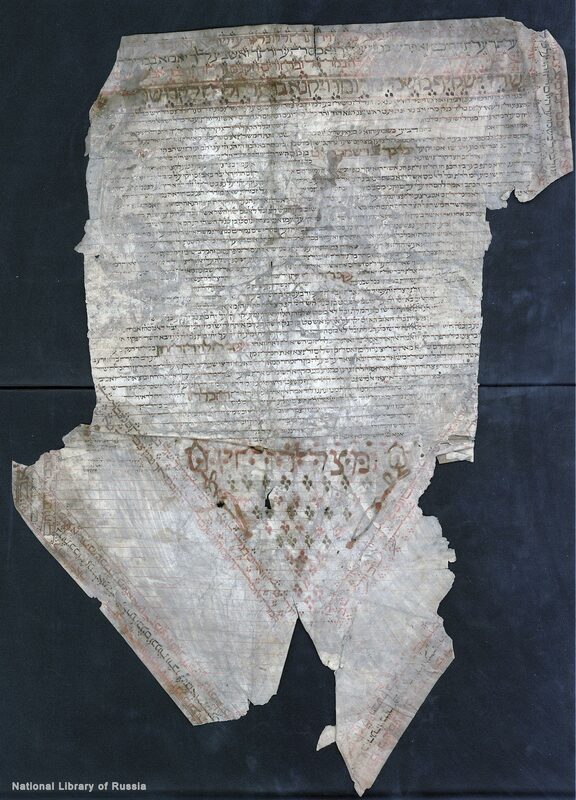 The parchment is slightly damaged in the upper part, there are dirty spots. 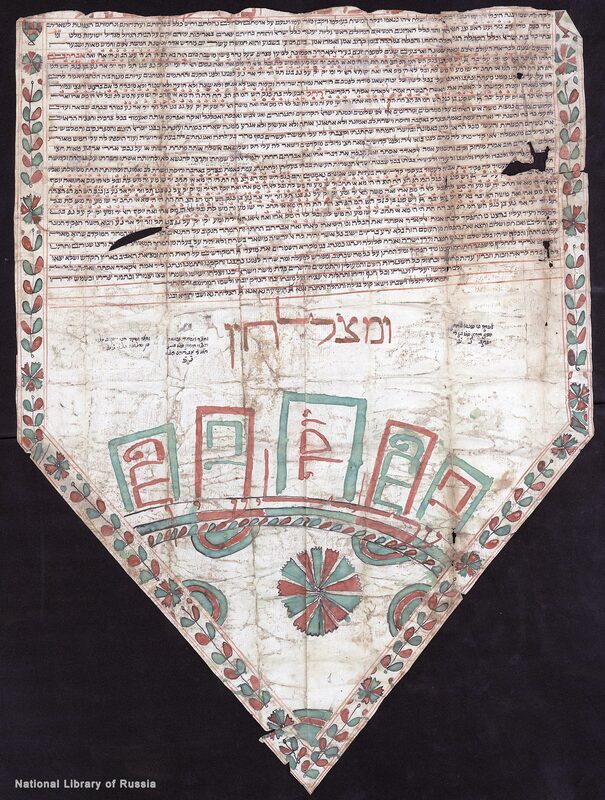 Marriage contract between the Karaite Isaac ha-Levi ben Solomon ha-Levi and the Karaite Rivka bat Joseph ben Joshu‘a. 5473 AM (year after the creation of the world) /2024 AG /1713 AD Cairo. Square hand script. The parchment is ruled and is framed. 1 fol. Parchment. 60 х49 cm. 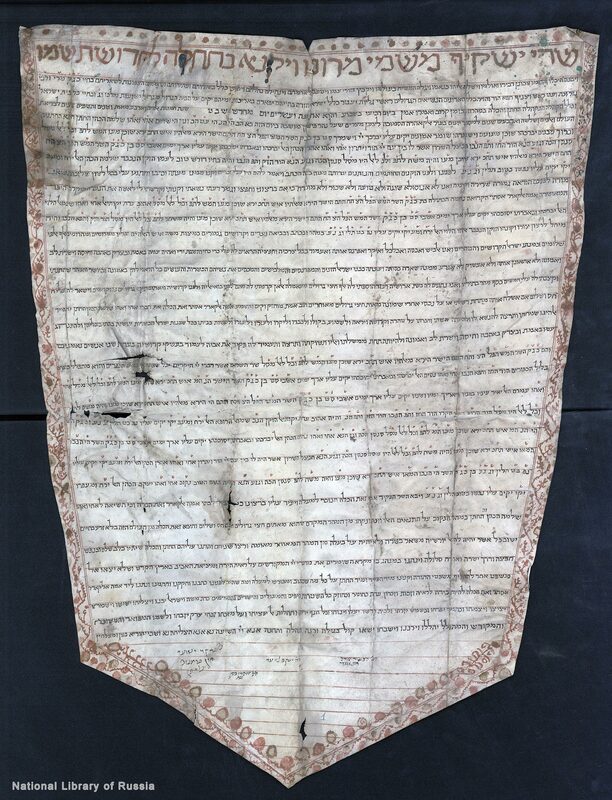 The document is pasted together with the contract of 1367 AD (No. 1). Marriage contract between the Karaite Joshu‘a ben Chaim ben Ja‘cob, ha-Rofeh, and Yaquta bat Shemu’el, ha-Rofeh, ben Joshu‘a, ha-Rofeh. 5477 AM (year after the creation of the world) /2028 AG /1717 AD Cairo. Square hand script. 1 fol. Parchment. 57 х63 cm. The parchment is ruled with red ink, the head line is also written in red. The back of the sheet contains the date of the document, written in blue pencil. 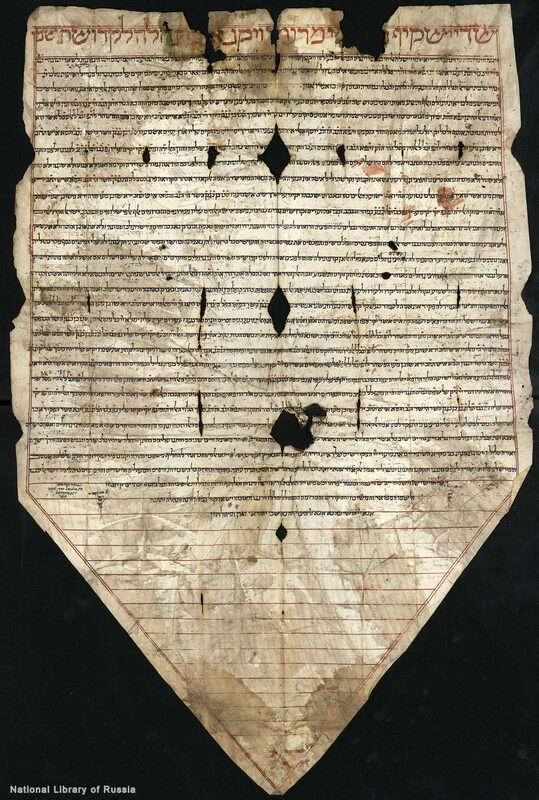 The lower part of the leaf is torn off (more than a quarter of the sheet is missing), the parchment is damaged at the folds. 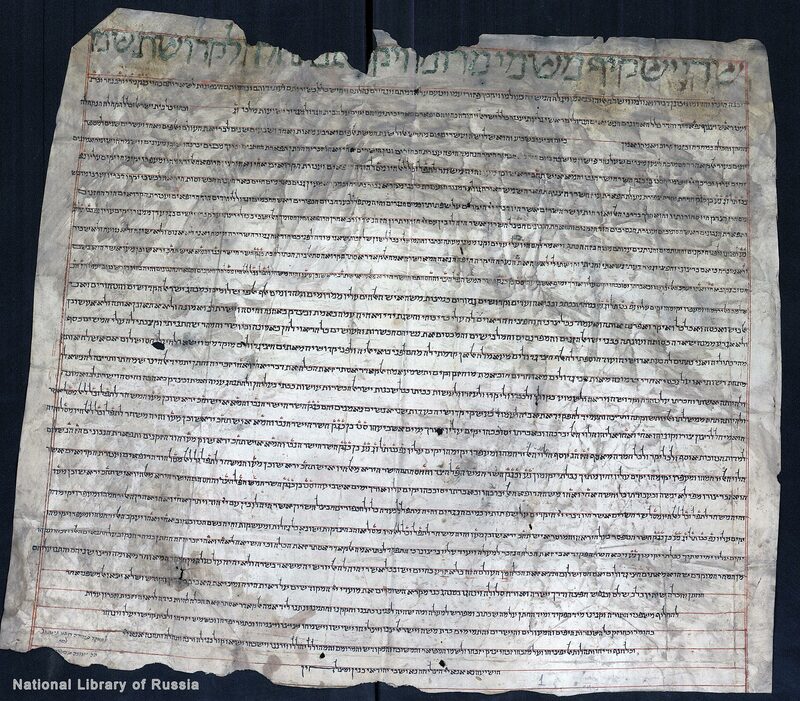 Marriage contract between the Karaite Avraham Ierushalmi ben Mordechai ha-Gabira and Marat-Fumiya bat Elijah Fawqa ha-Gabira. 5479 AM (year after the creation of the world) /1719 AD Qirq Yer (Chufut-Kale, a medieval city-fortress in the Crimea). Small Crimean semi-italic script. The complete list of the bride's dowry. 1 fol. Parchment. 70 х50 cm. The document has the form of a pentagon with a top coner. In margins, it is decorated with a luxury floral ornament. The text is enclosed in a frame drawn in red ink. Restored by the Israel Museum in 1993 & ndash; 1994, at the same time there was made the passepartout frame. 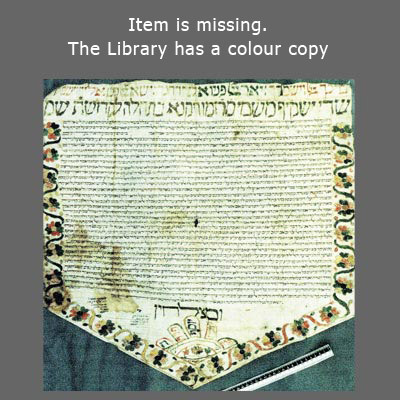 The document was returned from the Israel Museum on 16 October 1995. 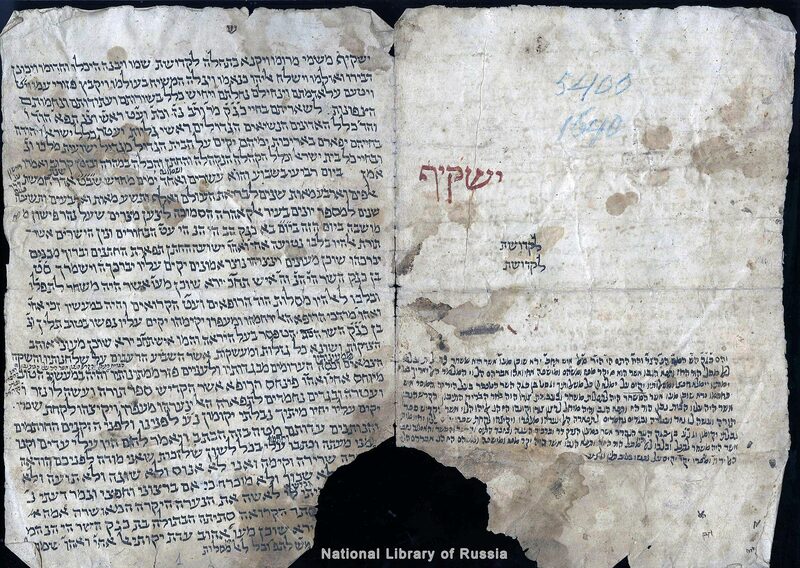 Published in: Ornament drevneevrejskih rukopisej / RNB (Ornamentation in Hebrew manuscripts / NLR); compilers are O. Vasilieva, B. Zaikovsky and A. Kantsedikas. Moscow; Tel Aviv, 2003. Illustrations 155–156. Marriage contract between the Karaite Nesim ben Shemu’el, ha-Rofeh, and Aziza bat Joshu‘a ben Avraham, ha-Rofeh. 5480 AM (year after the creation of the world) /2031 AG /1720 AD Cairo. Square hand script. 1 fol. Parchment. 60 х56,5 cm. The parchment is ruled with red ink, the head line is also written in red. The back of the sheet contains the date of the document, written in blue pencil. 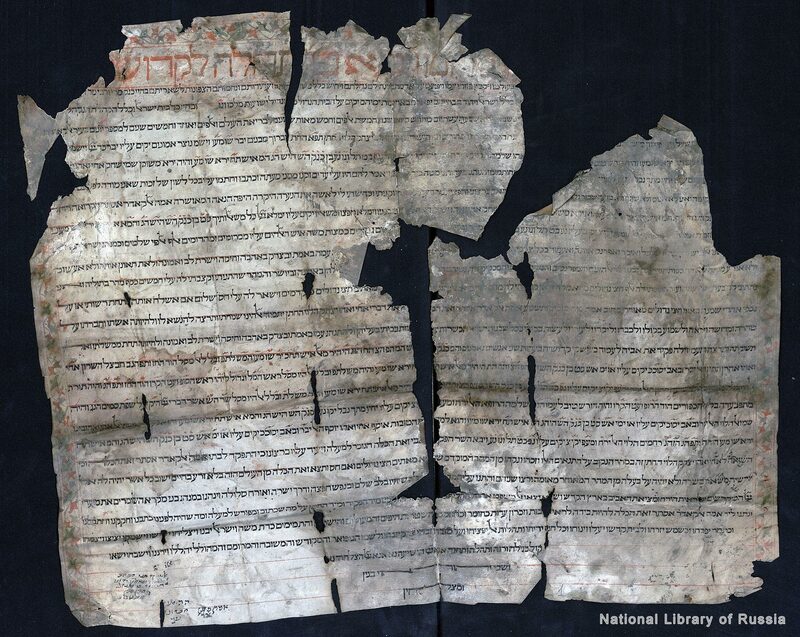 The parchment is damaged on the all four edges and at the folds, there are dirty spots. Marriage contract between the Karaite Solomon ha-Kohen ben Aharon ha-Kohen ben Solomon ha-Kohen and Nechama bat Shemu’el ha-Levi ben Elijah ha-Levi. 5492 AM (year after the creation of the world) /2043 AG /1732 AD Cairo. Square hand script. 1 fol. Parchment. 77,5 х64 cm. The document has the form of a pentagon. The parchment is ruled with red ink, the head line as well as an ornamental frame around the sheet are also executed using red ink. The back of the sheet contains the date of the document, written in blue pencil. 5500 AM (year after the creation of the world) /2051 AG /1740 AD Cairo. Square hand script. 1 fol. Parchment. 49 х56,5 cm. The parchment is ruled with red ink, the head line as well as a modest ornamental pattern in margins are also executed using red ink. The back of the sheet contains the date of the document, written in blue pencil. The top right part of the text has suffered from damp. Marriage contract between Avraham ha-Kohen ben Moshe ha-Kohen ben Shevahijah ha-Kohen and Esther bat Elijah ha-Levi ben Joshu‘a ha-Levi. 5506 AM (year after the creation of the world) /1746 AD Cairo. Square hand script. 1 fol. Parchment. 77,6 х58 cm. The document has the form of a pentagon. The parchment is ruled using red ink, the head line is written in green. A floral ornamental pattern and lines of text around the sheet and in the lower right corner are executed with red, green, blue and yellow paints. The back of the sheet contains the date of the document, written in blue pencil. The left part of the sheet is torn off. Marriage contract between Moshe ben Isra’el ben Ratzon, ha-Rofeh, and Esther bat Aharon ha-Kohen ben Moshe ha-Kohen. 5508 AM (year after the creation of the world) /2059 AG /1748 AD Cairo. Square hand script. 1 fol. Parchment. 59,5 х 66. 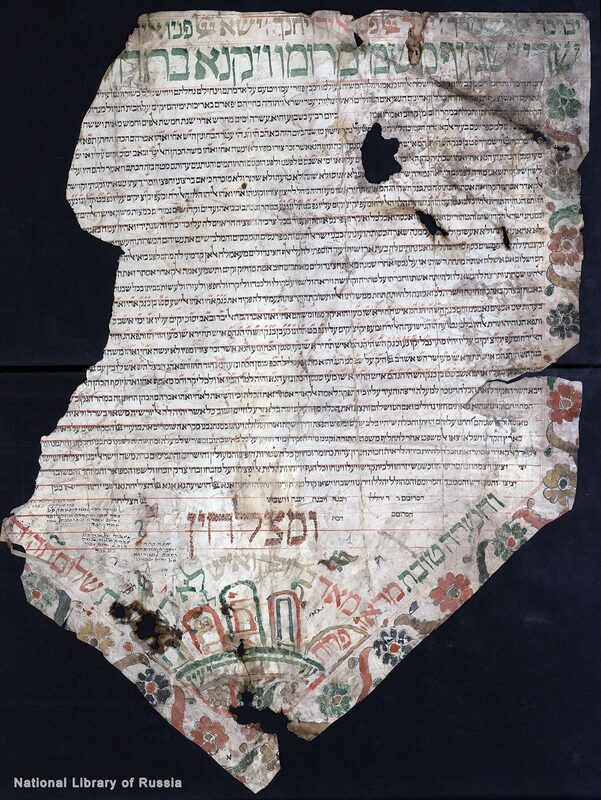 The document is decorated along the edges with a multicolored ornamental pattern. The back of the sheet contains the date of the document, written in blue pencil. The left bottom corner is torn off. 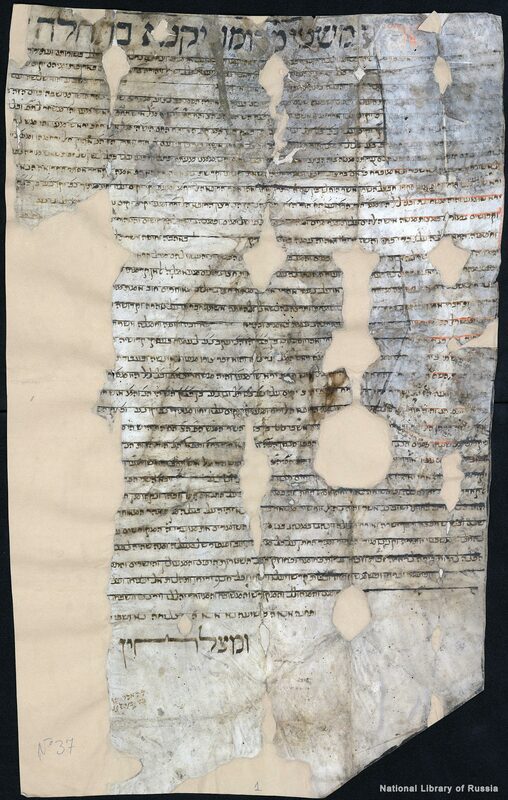 Marriage contract between Shemu’el ben Avraham and Sarah bat Jehuda, ha-Rofeh. Fragment (the beginning). 1 fol. Parchment. 33,5 х59,5 cm. The first two lines are written in large letters, with partial use of red ink, the parchment is ruled with red ink. 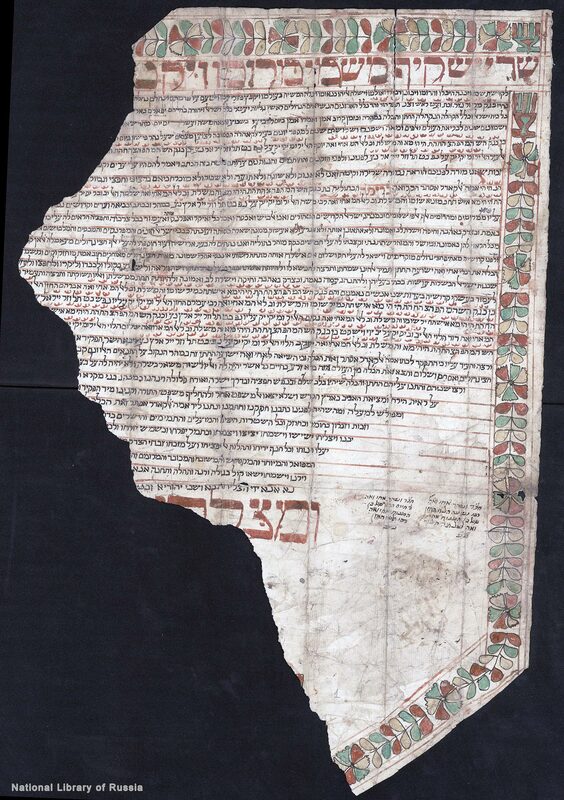 The side margins of the document is decorated with a multicolored ornamental pattern. 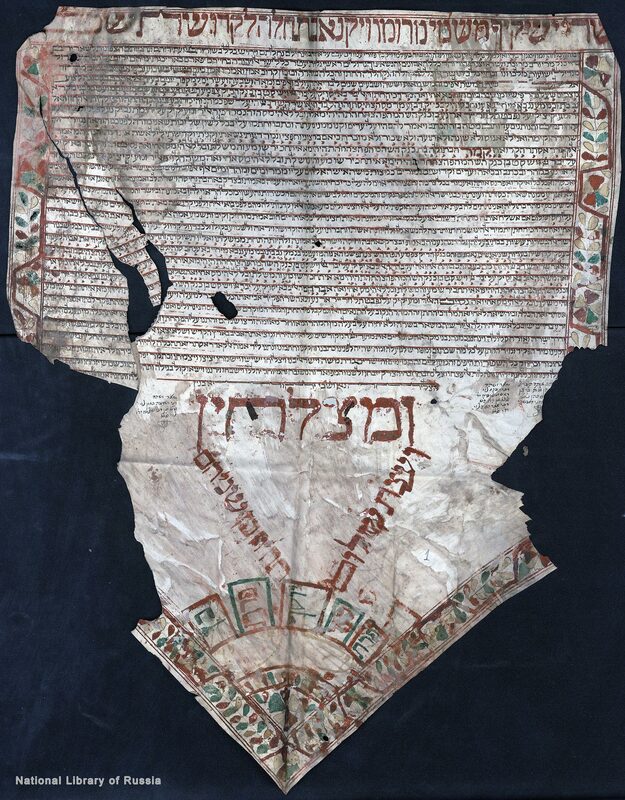 The leaf is torn off, the surviving text is damaged from dirt, moisture and the paint run on the parchment. Marriage contract between Avraham ben Isra’el ben Ratzon, ha-Rofeh, and Karima bat Nesim ben Avraham. 5513 AM (year after the creation of the world) /2064 AG /1753 AD Cairo. Square hand script. Signatures of witnesses are in Arabic. 1 fol. Parchment. 49 х56,5 cm. Ruled using red ink. The frame in the form of a chain is executed with red-brown, blue-green and yellow colours. The back of the sheet contains the date of the document, written in blue pencil. The right corners of the sheet are torn off. Marriage contract between Yom-Tov ben & hellip; ben Amram and Qamar bat Aharon Kohen. 5515 AM (year after the creation of the world) /2066 AG /1755 AD Cairo. 1 fol. Parchment. 51 х53 cm. Square hand script. The document is decorated with a floral ornamental frame. The leaf is torn off, significant parts of the text are missing. 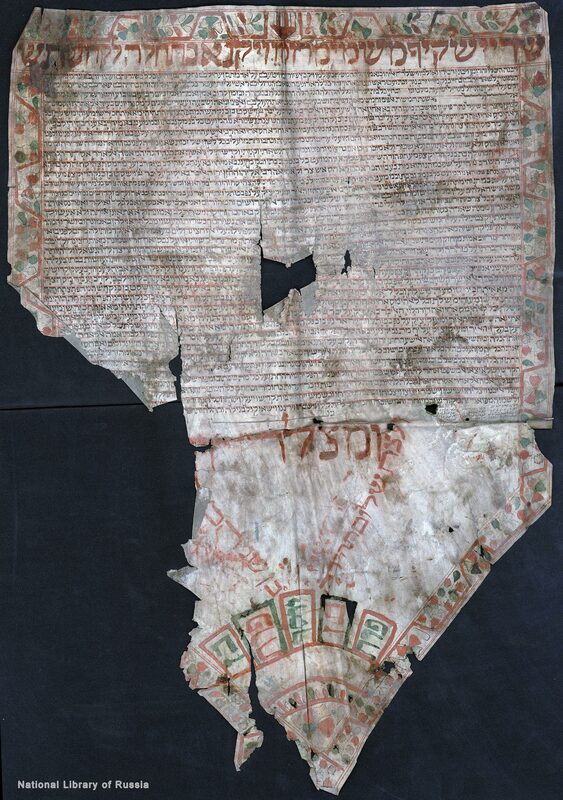 Marriage contract between the Karaite David bа Gedaliah ben Aharon with Maliha bat Ja‘cob ha-Levi. 5517 AM (year after the creation of the world) /2068 AG /1757 AD Cairo. Square hand script. 1 fol. Parchment. 70 х65 cm. The head line is also written in red paint. The document is decorated with a floral ornamental pattern in red, green and yellow paints along the edges and in the bottom corner. Marriage contract between the Karaite Joseph ben … and Hanna bat Aharon ha-Rofeh ??? Ratzon ha-Rofeh. 2070 AG /1759 AD Cairo. Karaite oriental handwriting. 1 fol. Parchment. 60 х40 cm. The parchment is ruled with black ink (on the right – in red ink). Marriage contract between Avraham ben Elijah ben Joseph and Marhaba bat Nahum ha-Kohen ben Aharon ha-Kohen. 5520 AM (year after the creation of the world) /2071 AG /1760 AD Cairo. Square hand script. 1 fol. Parchment. 61 х62 cm. The document has the form of a trapezoid. The parchment is ruled using red ink (ruling is poorly visible). The document is decorated in the side margins with a floral ornament in red, green and yellow paints. The back of the sheet contains the date of the document, written in blue pencil. The bottom corners of the sheet are torn off. 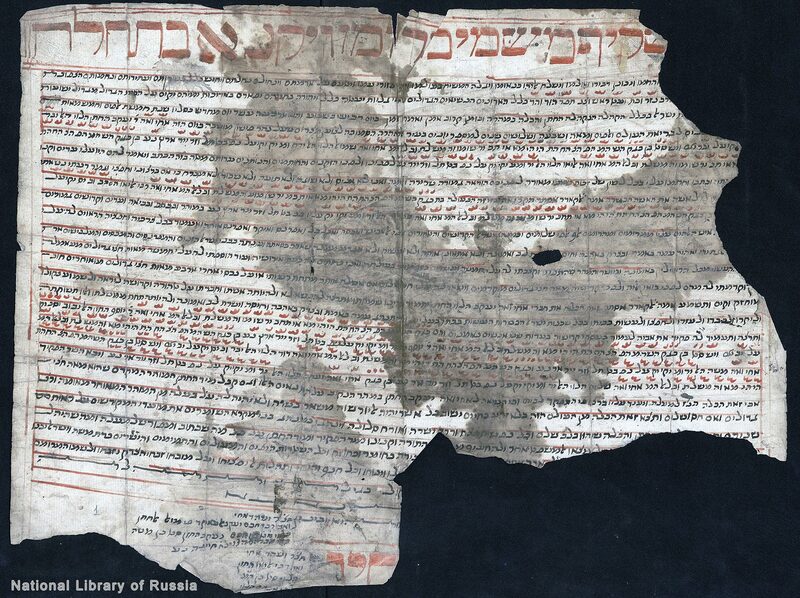 Marriage contract between the Karaite Japheth ben Obadiah ben Shemu’el and Habiba bat Joseph ben Joshu‘a. 5528 AM (year after the creation of the world) /2079 AG /1768 AD Cairo. Square hand script. Signatures of witnesses are in Arabic. 1 fol. Parchment. 54,5 х54,5 cm. The parchment is ruled using black ink. The lateral margins are decorated with flowers drawn in black ink. The back of the sheet contains the date of the document, written in blue pencil. The leaf is ragged on the edes. 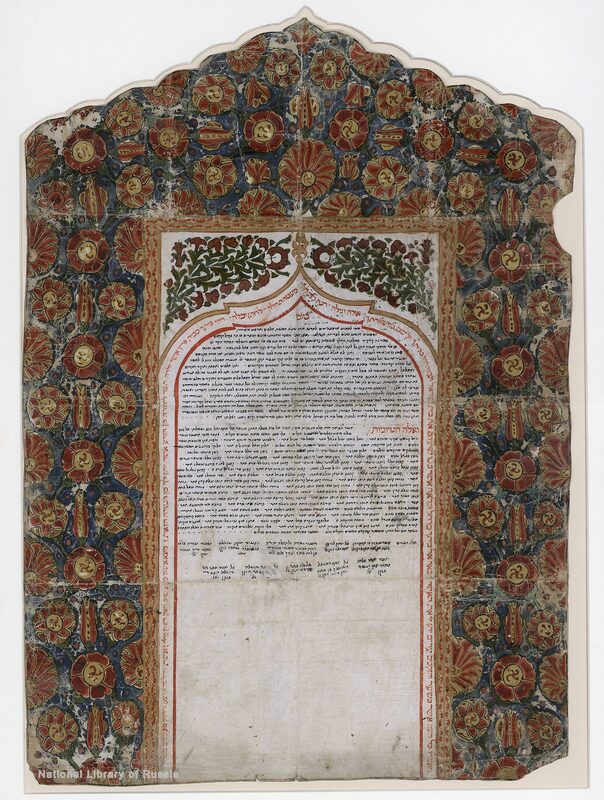 Marriage contract between the Karaite Sa‘adiah ben David ben Reuben and Mas’souda bat Ele‘azar ha-Kohen ben Aharon ha-Kohen. 1 fol. Parchment. 58 х65,5 cm. The head and end line is also written in red ink. The parchment is ruled using black ink. The back of the sheet contains the date of the document, written in blue pencil. The upper and lower parts of the sheet are slightly damaged. 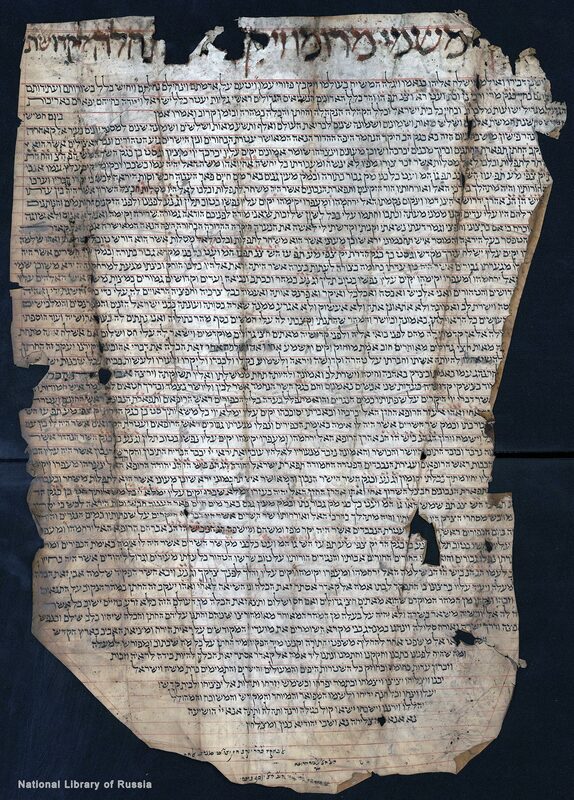 Marriage contract between the Karaite Yaquti’el-Shemu’el ben Isra’el ben Ratzon and Rachel bat Baruch ha-Levi ben Solomon ha-Levi. 5531 AM (year after the creation of the world) /2082 AG /1771 AD Cairo. Square hand script. 1 fol. Parchment. 54 х53 cm. The document originally has the form of a pentagon. The parchment is ruled using red ink. The two head lines and lines in the side margins are also written in red ink. The back of the sheet contains the date of the document, written in blue pencil. 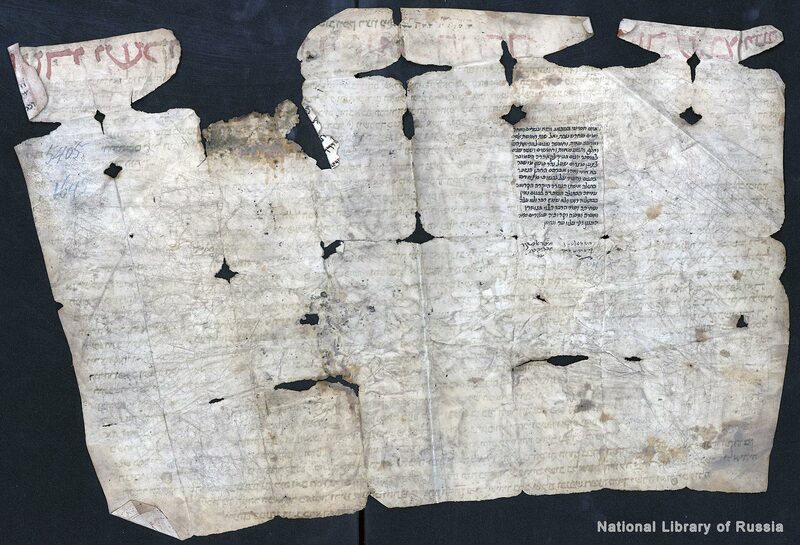 The bottom corners of the sheet are torn off, the parchment is damaged at the folds. 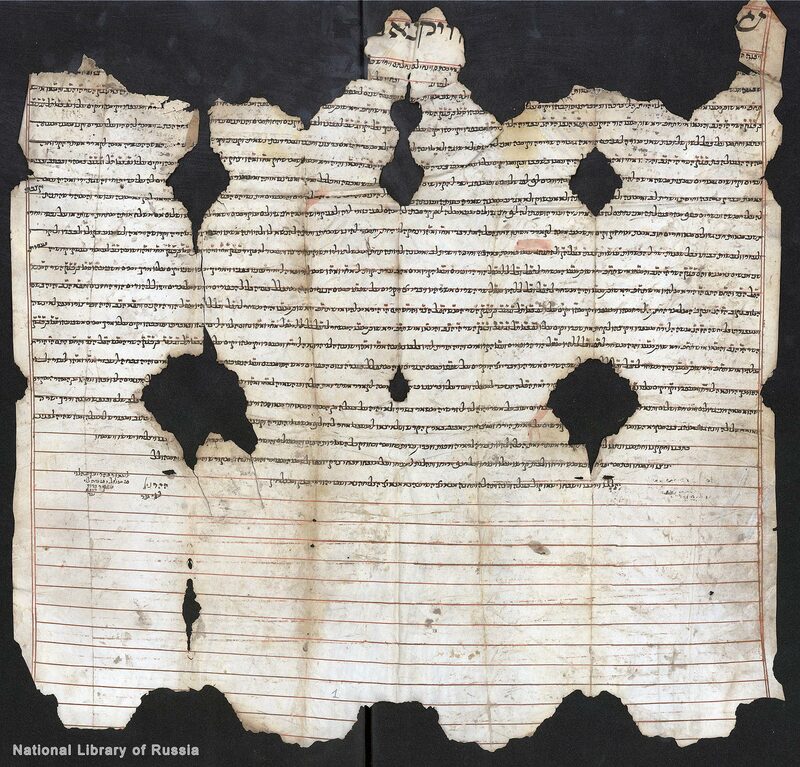 Marriage contract between the Karaite Joseph ben Joseph and Mas’souda bat Elisha‘ ben Joshu‘a. 5535 AM (year after the creation of the world) /2086 AG /1775 AD Cairo. Square hand script. Signatures of witnesses are in Arabic. 1 fol. Parchment. 75,5 х58 cm. The document has the form of a pentagon. The parchment is ruled with red ink that is also used for decoration, including lines of the border frame around the document. The back of the sheet contains the date of the document, written in blue pencil. The upper and right parts of the sheet are slightly damaged. Marriage contract between the Karaite Aharon ha-Levi ben Nahum ha-Levi ben Aharon ha-Levi and Dina bat Elijah ha-Levi ben Joshu‘a ha-Levi. 5537 AM (year after the creation of the world) /2087 AG /1777 AD Cairo. Scribe Shlomo Kohen Dimashqi. Karaite oriental handwriting. Signatures of witnesses are in Arabic. 1 fol. Parchment. 66,7 х54 cm. The document has the form of a pentagon. The parchment is ruled using red ink, the head line is also written in red. The border frame around the document contains one line of text. The back of the sheet contains the date of the document, written in blue pencil. The top right corner of the sheet is slightly torn off. 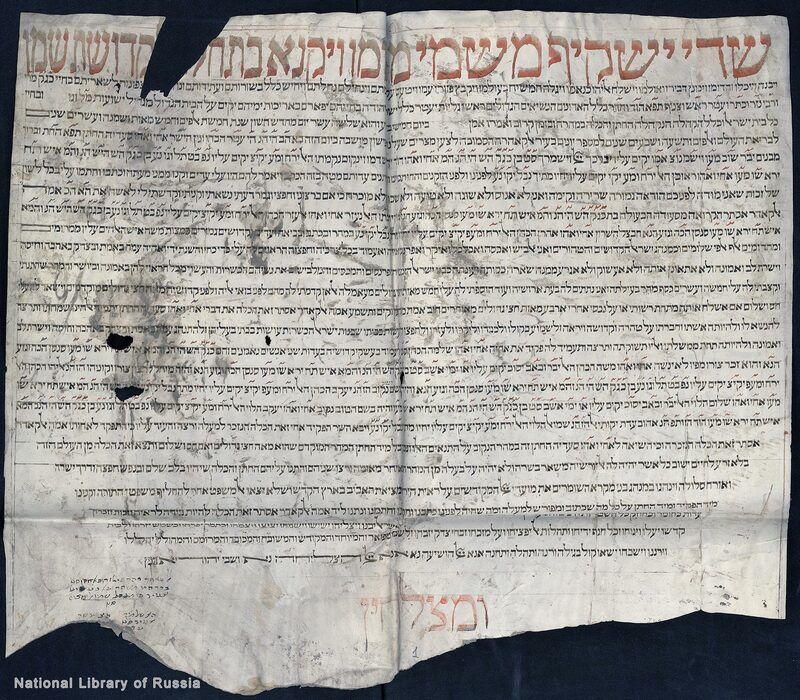 Marriage contract between the Karaite Sa‘adiah ben Shemu’el ben Sa‘adiah and … bat Avraham ben David. Fragment. 5537 AM (year after the creation of the world) /1777 AD Cairo. Square hand script. 1 fol. Parchment. 54 х27,5 cm. The parchment is ruled with red ink that is also used for the top line of the text. The back of the sheet contains the date of the document, written in blue pencil. The side parts of the sheet are missing. Marriage contract between Joseph ha-Levi ben Moshe ha-Levi and Sukkar bat Baruch ha-Levi ben Solomon ha-Levi. 1 fol. Parchment. 78 х40 cm. The document has the form of a pentagon. 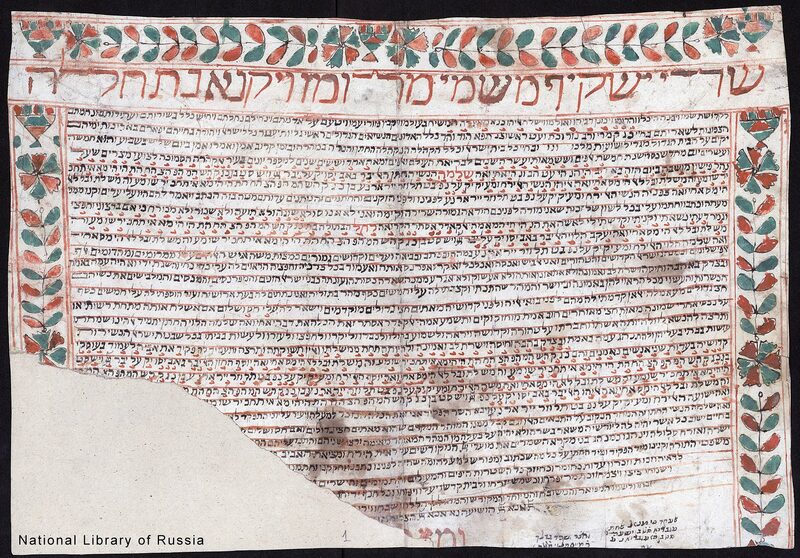 The parchment is ruled with red ink that is also used for the top lines of the text. The border frame around the document contains two lines of text. The back of the sheet contains the date of the document, written in blue pencil. 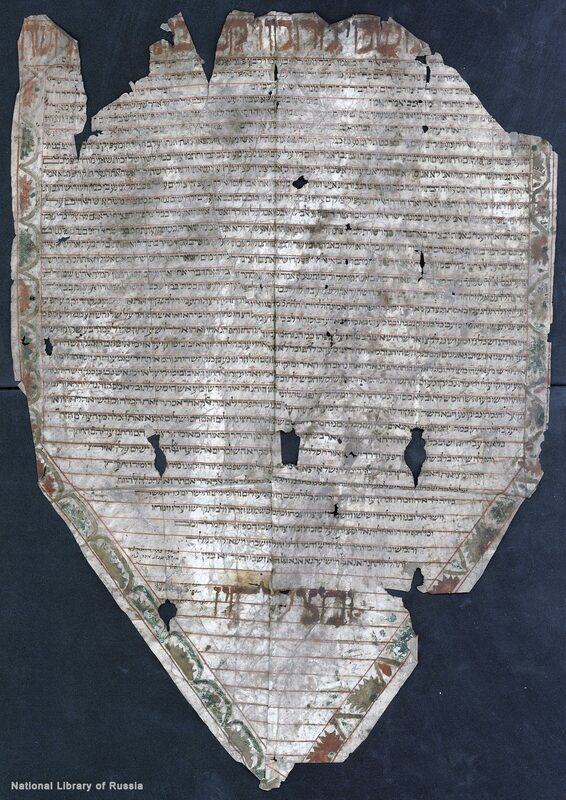 The left part of the sheet is torn off (more than a third of the text has been lost). 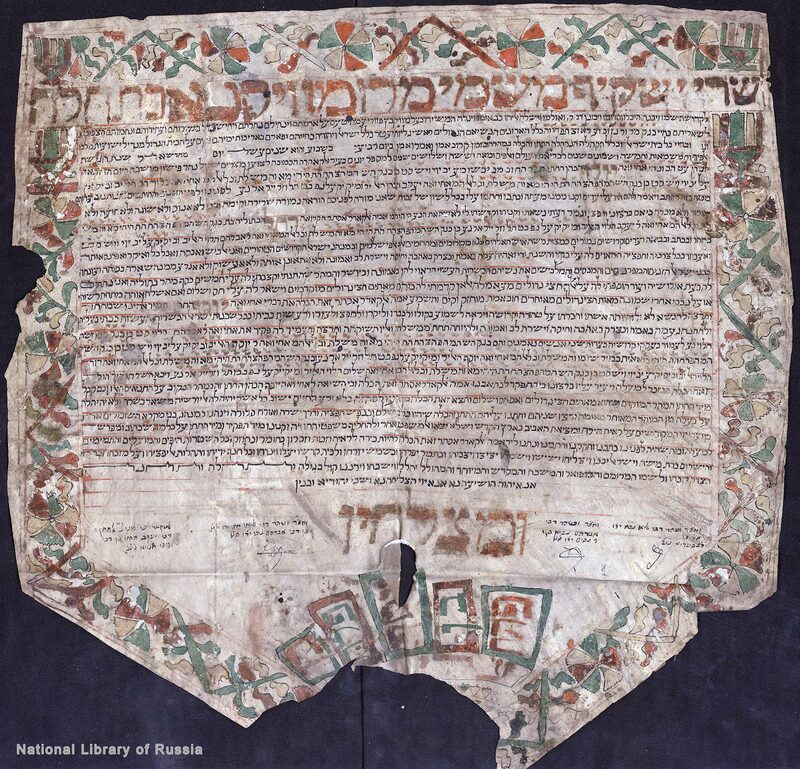 Marriage contract between Chaim ben … and … (a bride's name has been lost). Two fragments (the end of the contract). [the second half of the 18th cent.]. Square hand script. 1 fol. (the sheet is torn into two pieces). Parchment. 55,5 х26,7 cm. Ruled using red ink. The upper part is missing. The bottom corners of the sheet are cut off. It was restored (straightened, cleaned) in the 1960s. 5541 AM (year after the creation of the world) /2092 AG /1781 AD Cairo. Square hand script. Signatures of witnesses are in Arabic. 1 fol. Parchment. 81,5 х48 cm. The document has the form of a pentagon. The parchment is ruled with red ink that is also used for the lines of the text contained in the border frame. The back of the sheet contains the date of the document, written in blue pencil. 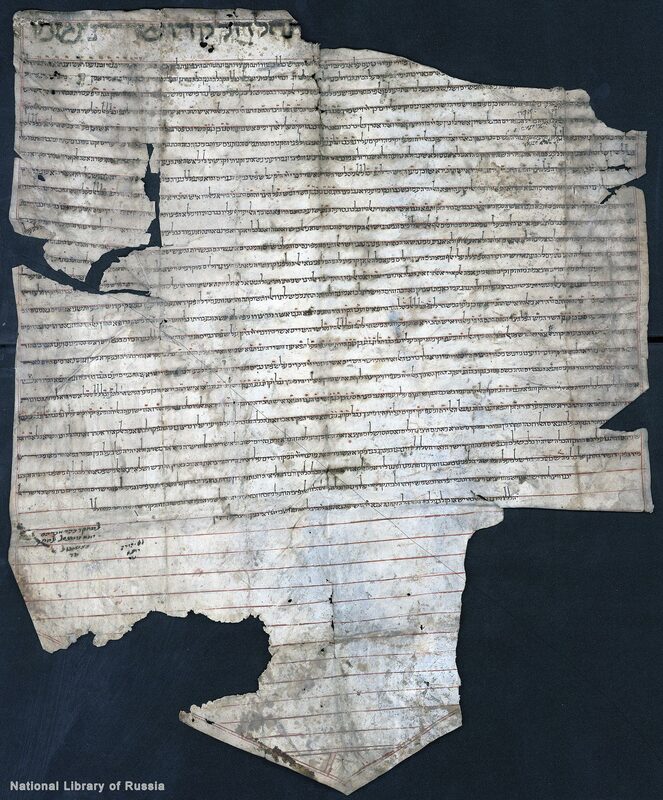 The right and left parts of the sheet are torn off, the text is erased in some places. 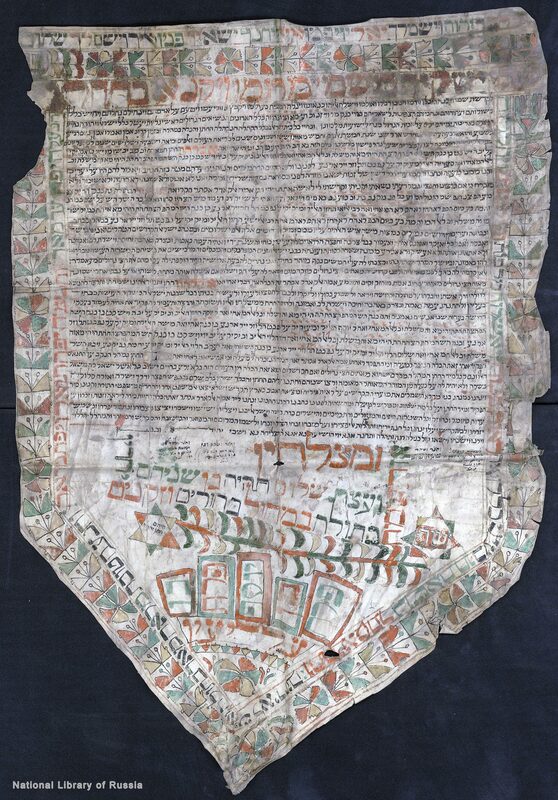 Marriage contract between the Karaite Elijah ben Isra’el ben Ratzon and Mazzal bat Ja‘cob ha-Kohen. 5543 AM (year after the creation of the world) /2094 AG /1783 AD Cairo. Square hand script. 1 fol. Parchment. 52 х48 cm. Ruled using red ink. Remains of the border frame consist of lines of text. The back of the sheet contains the date of the document, written in blue pencil. The right and left parts of the sheet are torn off, the upper part of the sheet is damaged. 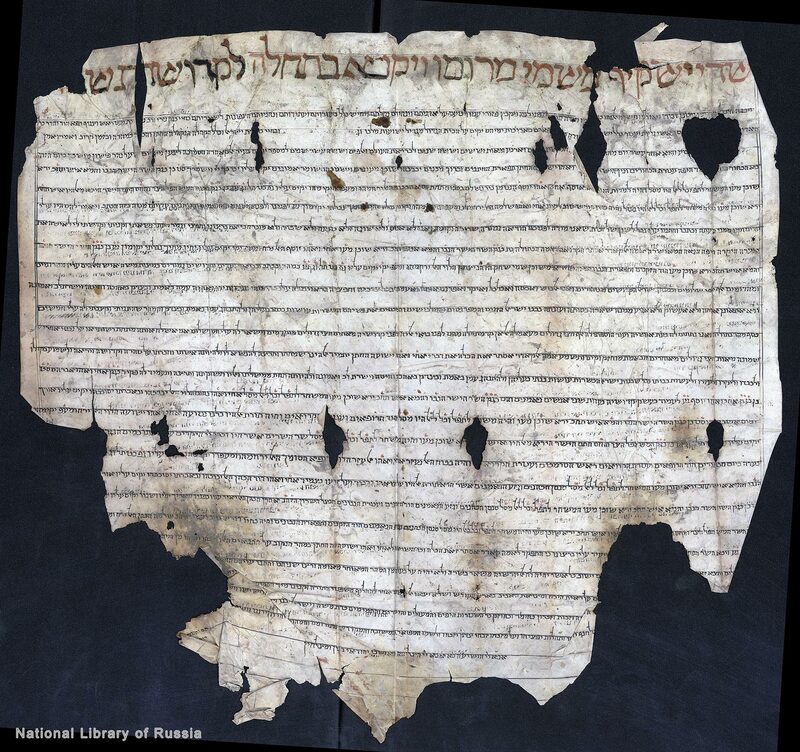 Marriage contract between the Karaite Obadiah ben Solomon and … bat Solomon. 5546 AM (year after the creation of the world) /2097 AG /1786 AD Cairo. Square hand script. Signatures of witnesses are in Arabic. 1 fol. Parchment. 66 х68 cm. The document has the form of a pentagon. The contract is decorated with the border frame executed with paints, and with a zigzag (herringbone) pattern. The back of the sheet contains the date of the document, written in blue pencil. The left corner is cut off. The upper and right parts of the sheet are damaged, a colour ornamental frame is imprinted in the center. 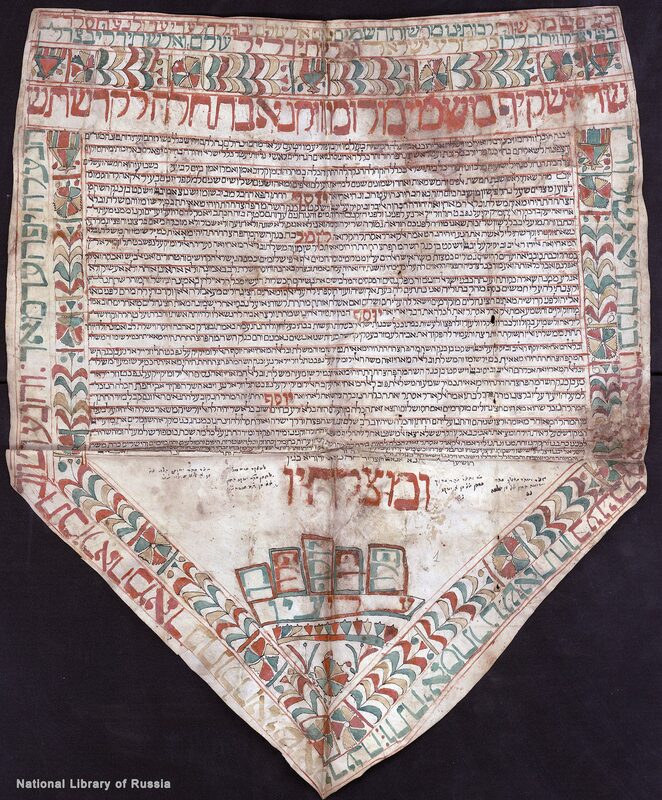 Marriage contract between the Karaite Ja‘cob and Mas’souda bat Avraham ben Jehuda. 5548 AM (year after the creation of the world) /2099 AG /1788 AD Cairo. Square hand script. Signatures of witnesses are in Arabic. 1 fol. Parchment. 69 х50,5 cm. The document has the form of a pentagon. The parchment is ruled with red ink, the head line is also written in red. The contract is decorated with the ornamental frame executed with red, green and yellow paints. The back of the sheet contains the date of the document, written in blue pencil. The sheet is damaged at the folds and in the upper part. Marriage contract between Joshu‘a ben Nesim ben Avraham and Esther bat Dani’el ben Joshu‘a. 5551 AM (year after the creation of the world) /1791 AD Cairo. Square hand script. 1 fol. Parchment. 50,5 х48 cm. The parchment is ruled with red ink, the head line is also written in red. The left margin bears the remains of the border frame consisting of one line. The back of the sheet contains the date of the document, written in blue pencil. 5557 AM (year after the creation of the world) /im5106 AG /1796 AD Cairo. Square hand script. 1 fol. Parchment. 79,5 х59 cm. The document has the form of a pentagon. Ruled using red ink. The contract is decorated with the floral ornamental frame executed with red and green paints as well as the border frame consisting of a line of text written in red ink. Parts of the sheet at the top and bottom are torn off, there are dirty spots. 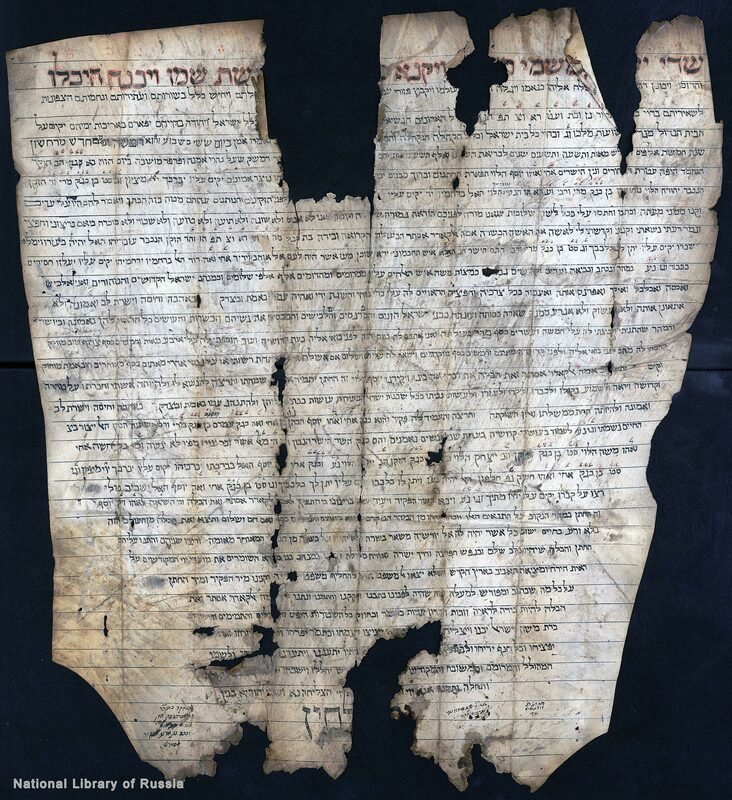 Marriage contract between Obadiah ben … and … bat Avraham. 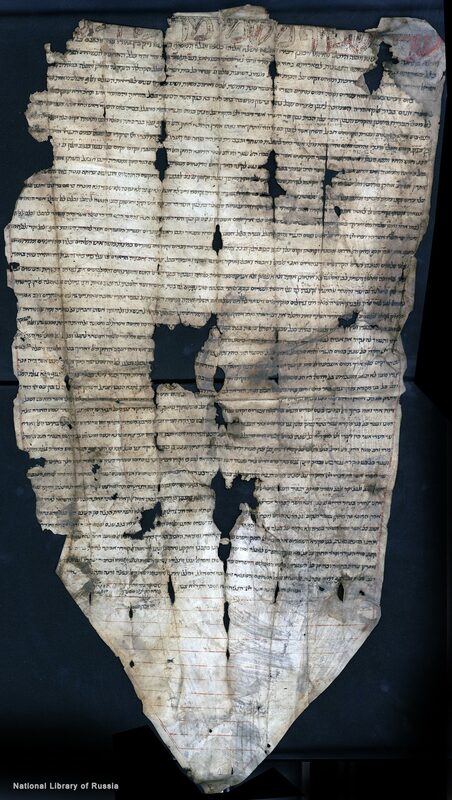 Fragment (the left part of the document). 55.. AM (year after the creation of the world) / [the 18th cent.]. Scribe Ele‘azar Rofeh, Hazzan. Square hand script. 1 fol. Parchment. 80,5 х28 cm. The document originally has the form of a pentagon. Ruled with black ink. A line along the edges of the sheet is written in red ink. The right part of the sheet is torn off; the suviving portion is damaged from damp. 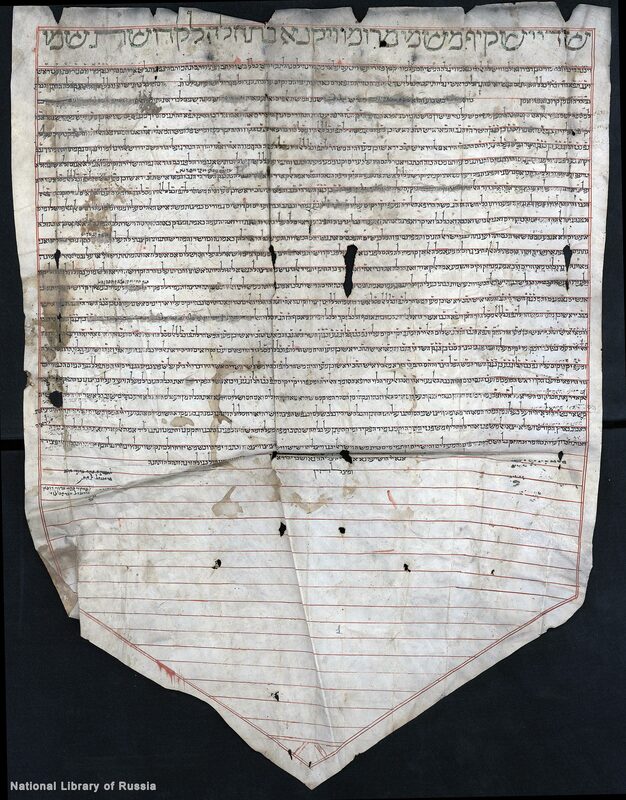 Marriage contract between the Karaite Joshu‘a and … (The name of the bride has been lost). Fragment (the final part). [18th cent.]. Square hand script. Signatures of witnesses are in Arabic. 1 fol. 38 х55 cm. The document originally has the form of a pentagon. Ruled with red ink that is also used for a border frame consisting of lines of prayers and sayings. The sheet is damaged from damp, the upper part is torn off. 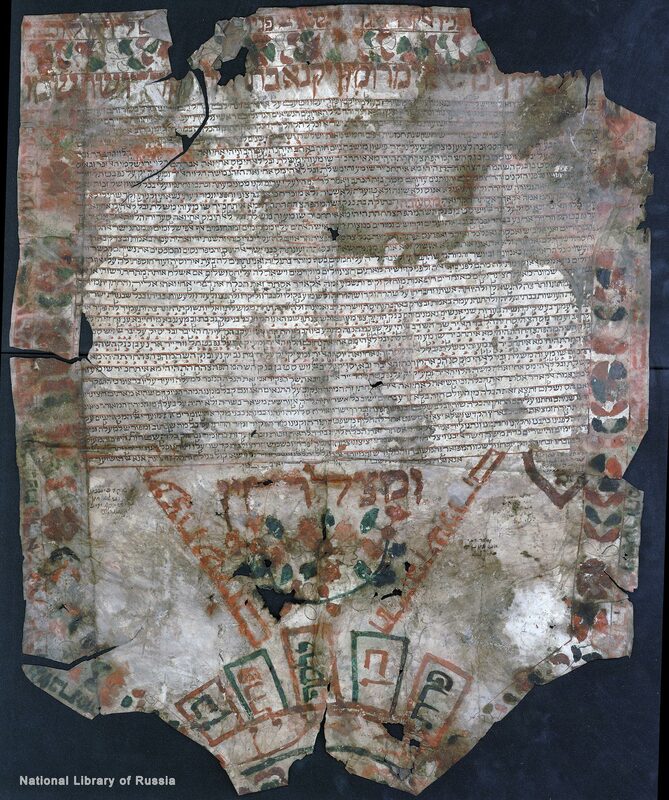 Marriage contract between the Karaite Elijah ha-Kohen ben Avraham ha-Kohen and Qamar bat Avraham ha-Levi. 5561 AM (year after the creation of the world) /im5112 AG /1801 AD Cairo. Square hand script. 1 fol. Parchment. 84 х71 cm. The document has the form of a pentagon. The parchment is ruled with red paint that is also used for an ornamental pattern and text in a frame. The back of the sheet contains the date of the document, written in blue pencil. The right bottom corner of the sheet is torn off, the text is partially damaged from paint run on it, there are dirty spots. 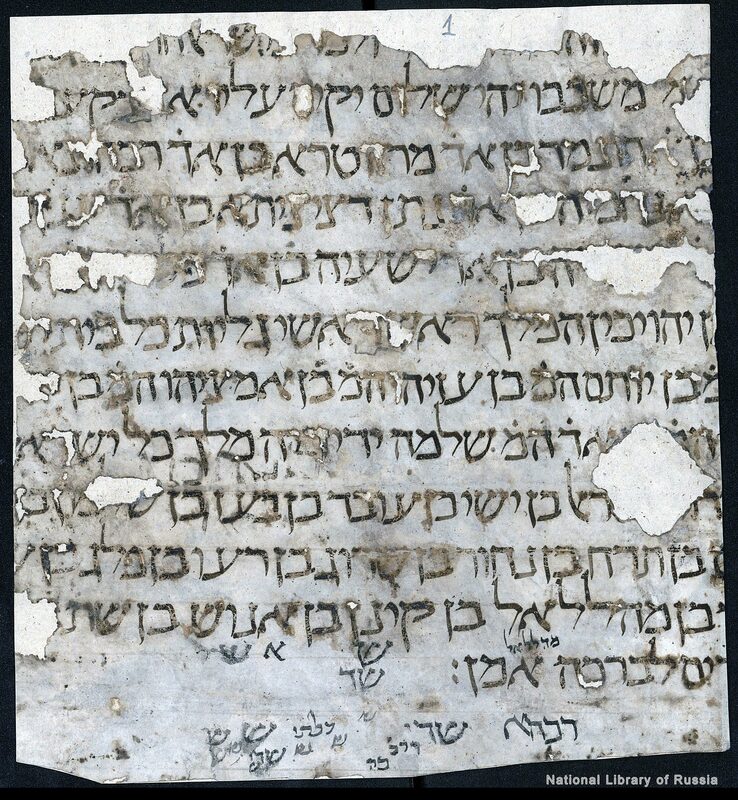 Marriage contract between the Karaite Elijah ben Avraham ha-Levi ben Moshe ha-Levi and Mas’souda bat Joseph ha-Levi ben Sa‘adiah ha-Levi. 5563 AM (year after the creation of the world) /1803 AD Cairo. Square hand script. 1 fol. Parchment. 75 х62 cm. The document has the form of a pentagon. The head line is written in red paint. The parchment is also ruled with red paint that, together with green one, is used for decoration of the border frame and the bottom corner. The back of the sheet contains the date of the document, written in blue pencil. The sheet is slightly torn off, text is damaged from damp, there are dirty spots. Marriage contract between the Karaite Joseph ben Elisha‘ ben Joshu‘a and … bat Isaac ha-Levi, Hazzan, ben Avraham ha-Levi. 5563 AM (year after the creation of the world) /im5114 AG /1803 AD Cairo. Square hand script. 1 fol. Parchment. 45 х58 cm. The parchment is ruled with red paint that is also used for a ornamental border frame. The back of the sheet contains the date of the document, written in blue pencil. 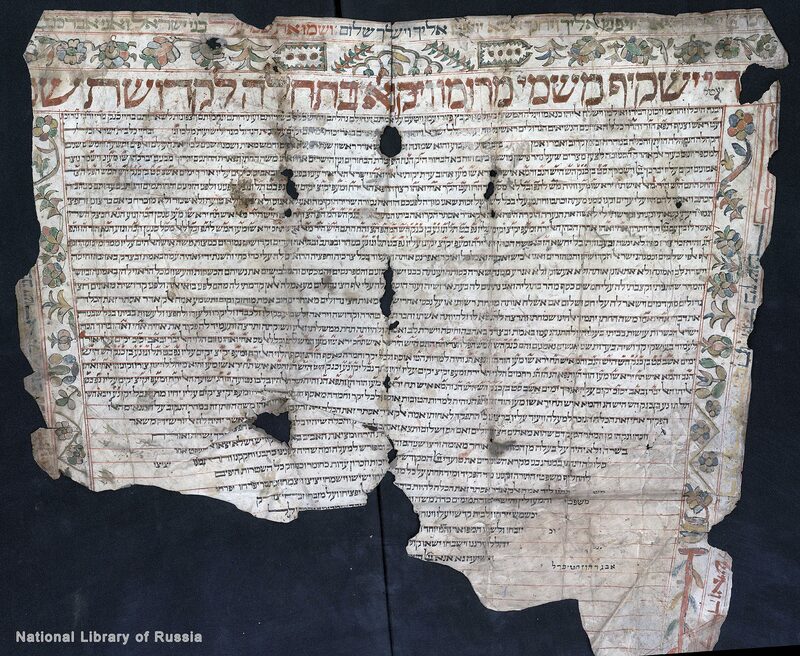 Marriage contract between the Karaite Nesim ben Joseph and Dina bat … Fragment (the left part). 5566 AM (year after the creation of the world) /2099 AG /im5117 AD [Cairo]. Square hand script. 1 fol. Parchment. 75 х45 cm. The parchment is ruled with red ink, the head line is also written in red. The document is embelished with a floral ornamental frame executed with red and green paints that is also used for decoration of the bottom corner - cone. The back of the sheet contains the date of the document, written in blue pencil. The right side of the sheet is torn off. Marriage contract between the Rabbanite Avraham Ashkenazi ben Joseph and Esther bat Shemu’el. In Aramaic. 5575 AM (year after the creation of the world) /1815 AD Cairo. Sephardic italics. 1 fol. Parchment. 27,5 хim51,5 cm. The document has the form of a pentagon (with the top corner - cone). The contract is decorated with a frame executed with red ink. Marriage contract between Elisha‘ ben Joseph ben Elisha‘, Hazzan, and Aziza bat Elijah, Hazzan, ben Elisha‘, Hazzan. 5476 AM (year after the creation of the world) /im5127 AG /1816 AD Cairo. Scribe Joseph Kohen ben Nesim Kohen Dimashqi. Square hand script. 1 fol. Parchment. 78,5 х56 cm. The document has the form of a pentagon. The document is embelished with a floral ornamental frame executed with red and green paints that is also used for decoration of the bottom corner - cone. The back of the sheet contains the date of the document, written in blue pencil. The bottom left edge of the sheet is torn off, there are dirty spots. 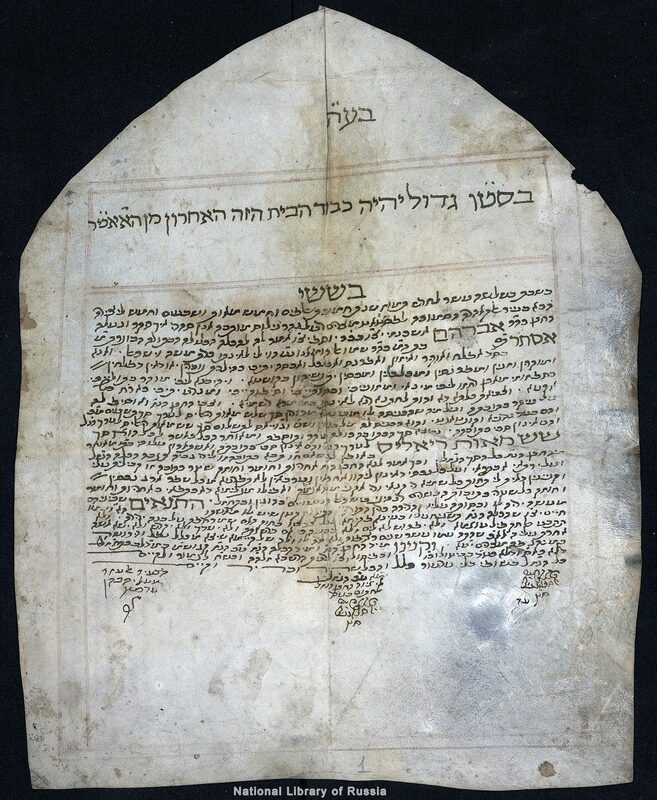 Marriage contract between the Karaite Mordechai ben Yaquti’el, Hazzan, ben Mordechai and Qamar bat Nesim ha-Levi ben Moshe ha-Levi. 5576 AM (year after the creation of the world) /im5127 AG /1816 AD Cairo. Scribe Joseph Kohen ben Nesim Kohen Dimashqi. Square hand script. Signatures of witnesses are in Arabic. 1 fol. Parchment. 70,7 х58 cm. The document has the form of a pentagon. The parchment is ruled with red paint. The head line is also written in red. The document is embelished with a floral ornamental frame executed with red and green paints that is also used for decoration of the bottom corner - cone. The back of the sheet contains the date of the document, written in blue pencil. The right the left lower part of the sheet are torn off. Marriage contract between the Karaite Solomon ben Elijah, Hazzan, ben Elisha‘, Hazzan, and Aziza bat Joseph. 5577 AM (year after the creation of the world) /im6228 AG /1817 AD Cairo. Square hand script. Signatures of witnesses are in Arabic. 1 fol. Parchment. 80,5 х61,5 cm. The document has the form of a pentagon. The parchment is ruled with red paint. The head line is also written in red. The document is embelished with a floral ornamental frame executed with red and green paints that is also used for decoration of the bottom corner - cone. The back of the sheet contains the date of the document, written in blue pencil. 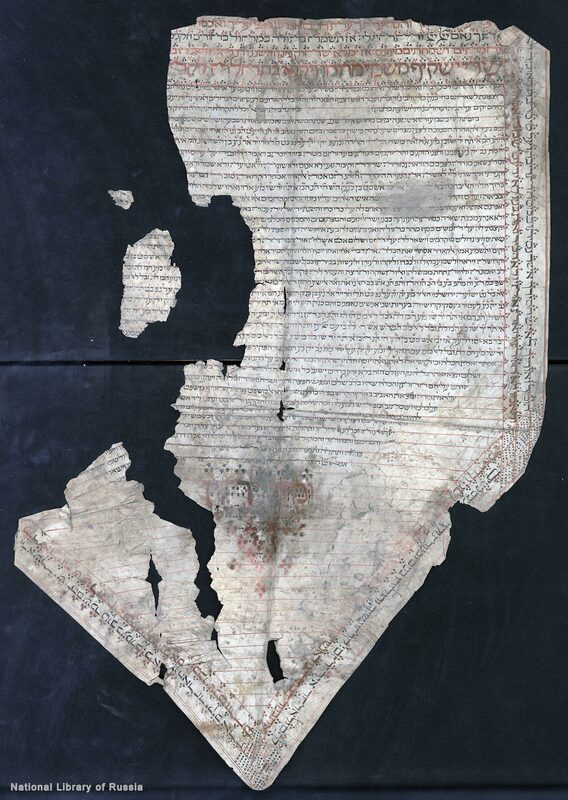 The parchment is slightly damaged on the edges and at the folds, there are dirty spots. 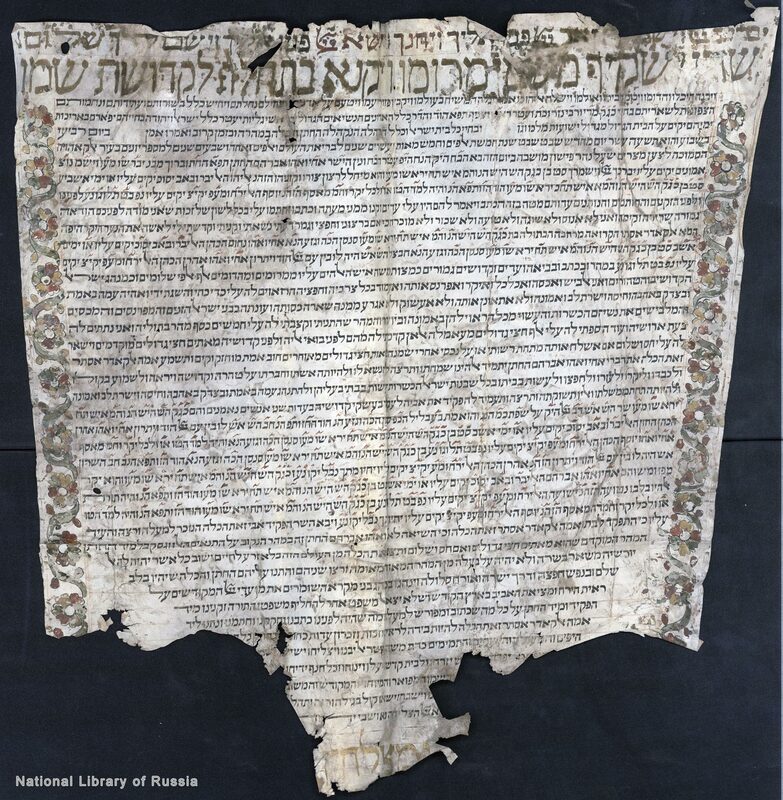 Marriage contract between the Karaite Joshu‘a ha-Levi ben Isaac ha-Levi ben Avraham ha-Levi and Qamar bat Ja‘cob ha-Levi ben Avraham ha-Levi. 5577 AM (year after the creation of the world) /im6228 AG /1817 AD Cairo. Scribe Joseph Kohen ben Nesim Kohen Dimashqi. Square hand script. 1 fol. Parchment. 75 х59,5 cm. The document has the form of a pentagon. The parchment is ruled with red paint that is also used for the head line and a line of text in the border frame. An ornamental pattern in the border frame and decoration of the lower corner - cone are executed using red, green and yellow paints. Marriage contract between the Karaite Elijah ben Avraham ben Joseph and Dina bat Avraham ben Moshe. 5579 AM (year after the creation of the world) /1819 AD Cairo. Square hand script. 1 fol. Parchment. 48 х47 cm. The document has the form of a pentagon. The head line is also written in red, The parchment is ruled, a line of the text in the border frame and the bottom corner - cone are executed using red paint. The sheet is rumpled, dirty and torn off on the left and right, and at the bottom. 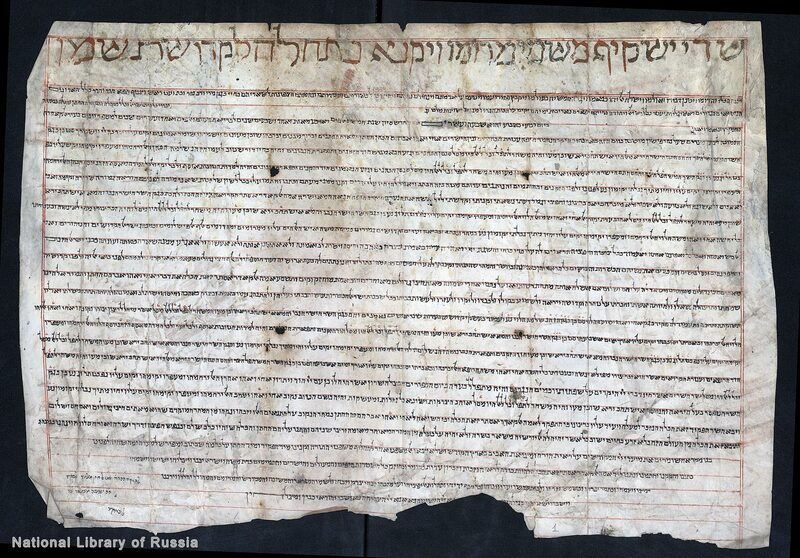 Marriage contract between the Karaite Solomon ben Avraham ben Elijah and Hanna bat Elijah ben Avraham. 5580 AM (year after the creation of the world) /im6229 AG /1819 AD Cairo. Karaite oriental handwriting. Signatures of witnesses are in Arabic. 1 fol. Paper. 41,5 х 48. The document contains a watermark depicting «three crescents». The parchment is ruled with red ink, the head line is also written in red. The lower edge is torn off. 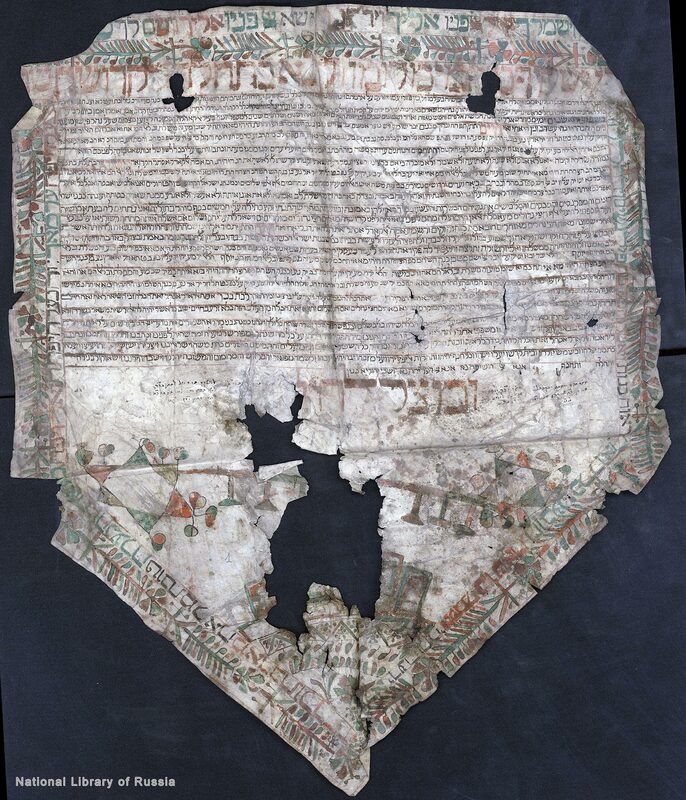 Marriage contract between the Karaite Chaim ben Avraham ben Aharon and Mas’souda (?) bat Ja‘cob ha-Levi ben Avraham. 5581 AM (year after the creation of the world) /im6232 AG /18im62 AD Cairo. Square hand script. Signatures of witnesses are in Arabic. 1 fol. Parchment. 75 х63,5 cm. The document has the form of a pentagon. 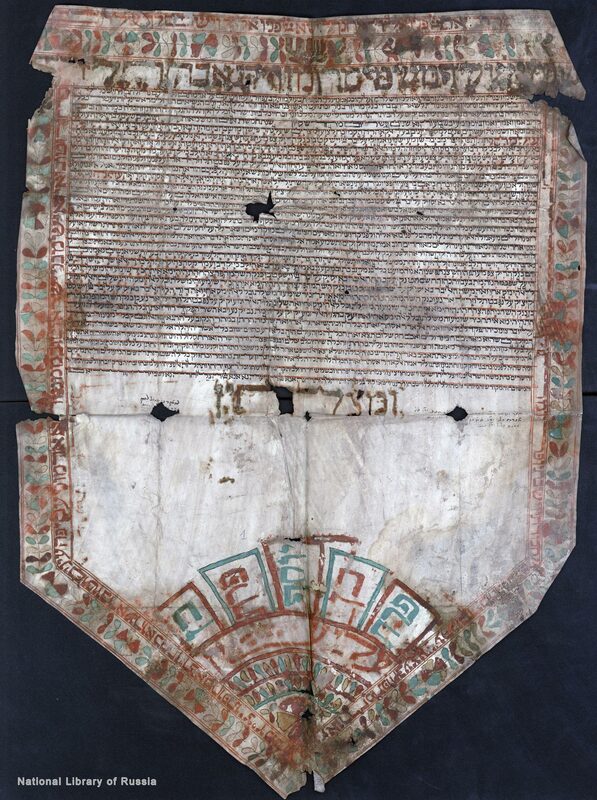 The parchment is ruled with red paint that is also used for the head and end lines. A line of the text as well ornamental patterns in the border frame and in the bottom corner-cone are executed using red and green paints. 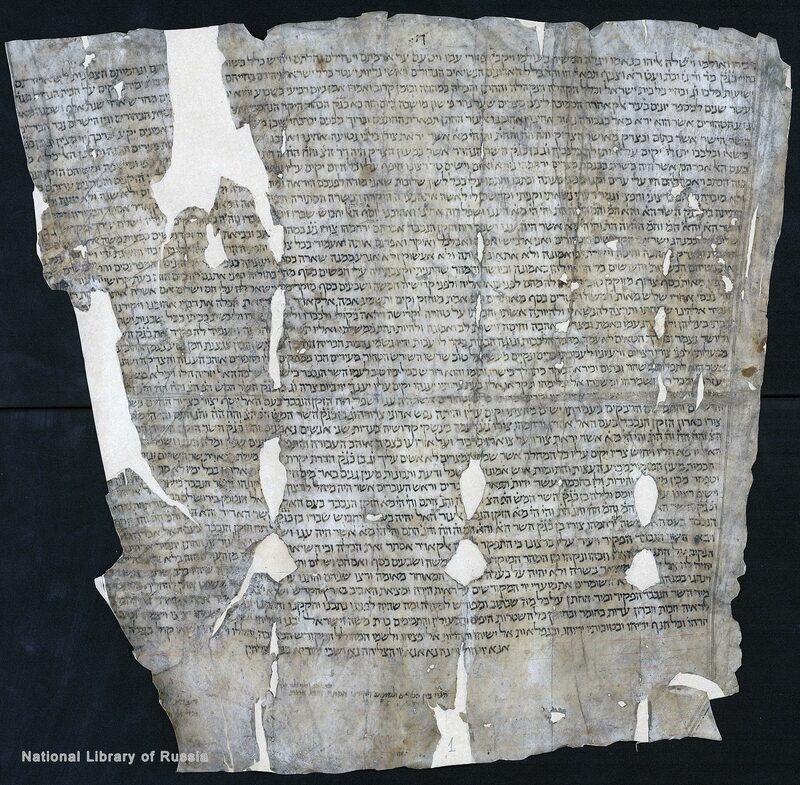 The document is damaged along the edges, there is loss of the parchment at the end of the text. 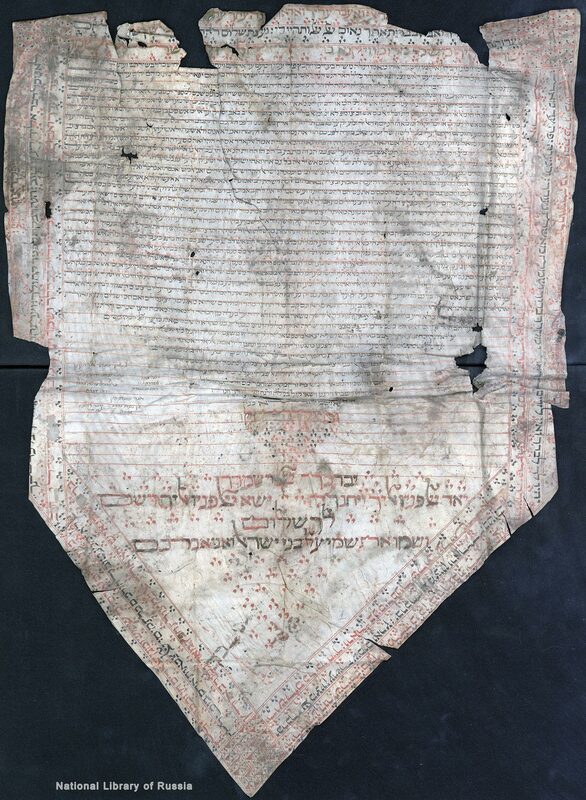 Marriage contract between the Karaite Joseph ben Ja‘cob ha-Kohen and Qamar bat Elijah ben Sa‘adiah. 5581 AM (year after the creation of the world) /im6232 AG /18im62 AD Square hand script. Signatures of witnesses are in Arabic. 1 fol. Parchment. 71,7 х61 cm. The document has the form of a pentagon. 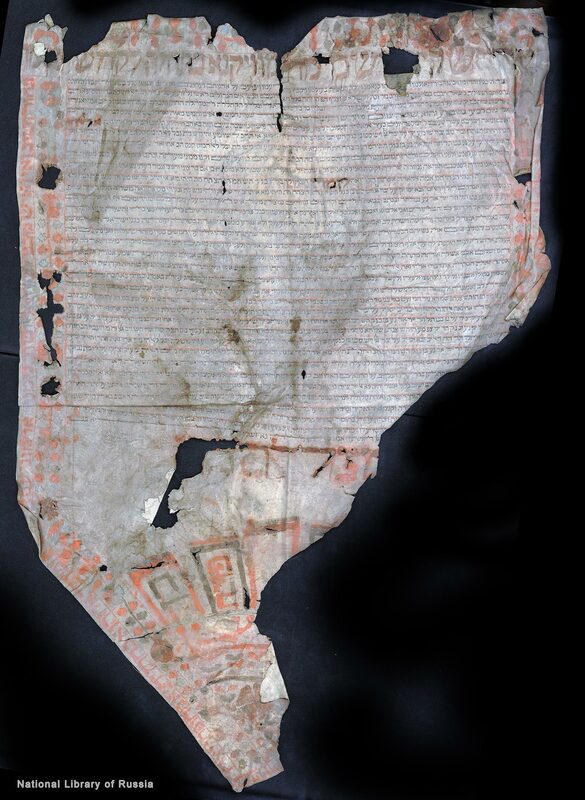 The parchment is ruled with red paint that is also used for the head and end lines. A line of the text as well an ornamental pattern in the border frame are executed using red, yellow and green paints. Marriage contract between the Karaite Joseph ha-Kohen ben Baruch ha-Kohen ben Ja‘cob ha-Kohen and Rachel bat Ja‘cob ha-Levi ben Avraham ha-Levi. 5585 AM (year after the creation of the world) /im6236 AG /1825 AD Cairo. Square hand script. Signatures of witnesses are in Arabic. 1 fol. Parchment. 53,5 х54,5 cm. The document has the form of a pentagon. 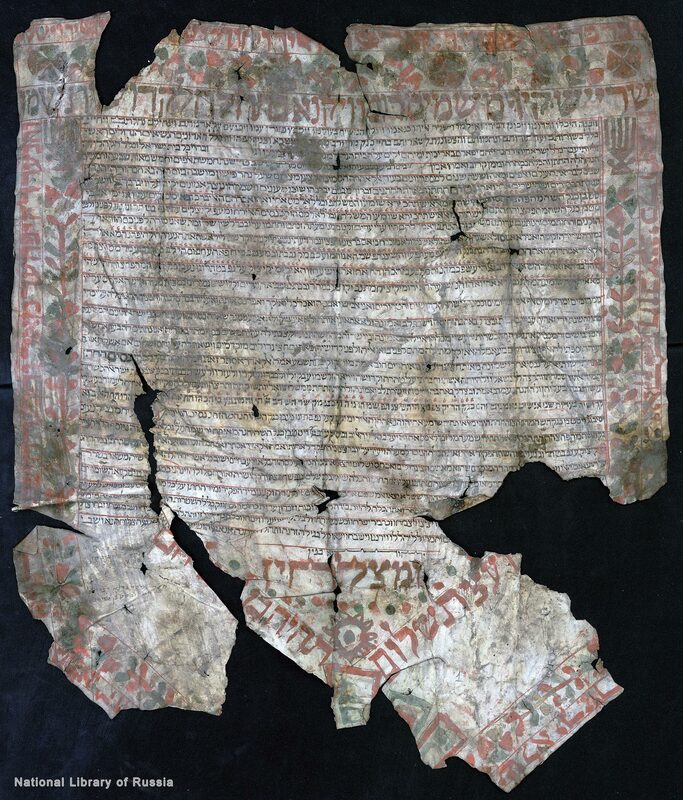 The parchment is ruled with red paint that is also used for the head and end lines. An ornamental pattern in the border frame are executed using red, yellow and green paints. The bottom corner - cone of the sheet is torn off. 5586 AM (year after the creation of the world) /im6237 AG /1826 AD Cairo.Square hand script. Signatures of witnesses are in Arabic. 1 fol. Parchment. 74,5 х54 cm. The document has the form of a pentagon. The parchment is ruled with red paint that is also used for the head and end lines. An ornamental pattern in the border frame are produced using red, yellow and green paints. The text line along the border frame and in the bottom corner - cone are executed using red and green paints, and black ink. There are small dirty spots. 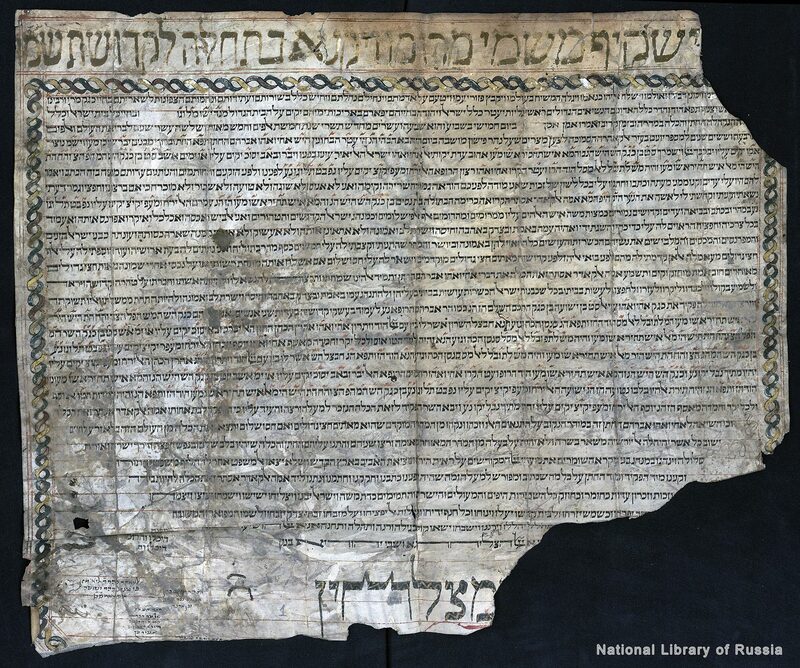 Marriage contract between the Karaite Ja‘cob ha-Levi ben Shemu’el ben Elijah ha-Levi and Aziza bat Elijah ben Sa‘adiah. 5586 AM (year after the creation of the world) /im6277 AG /1826 AD Cairo. Karaite oriental handwriting. Signatures of witnesses are in Arabic. 1 fol. Paper. 45 х55,5 cm. The parchment is ruled with red ink, the head line is also written in red. The right coner and bottom edge of the sheet are torn off. There are damp stains. 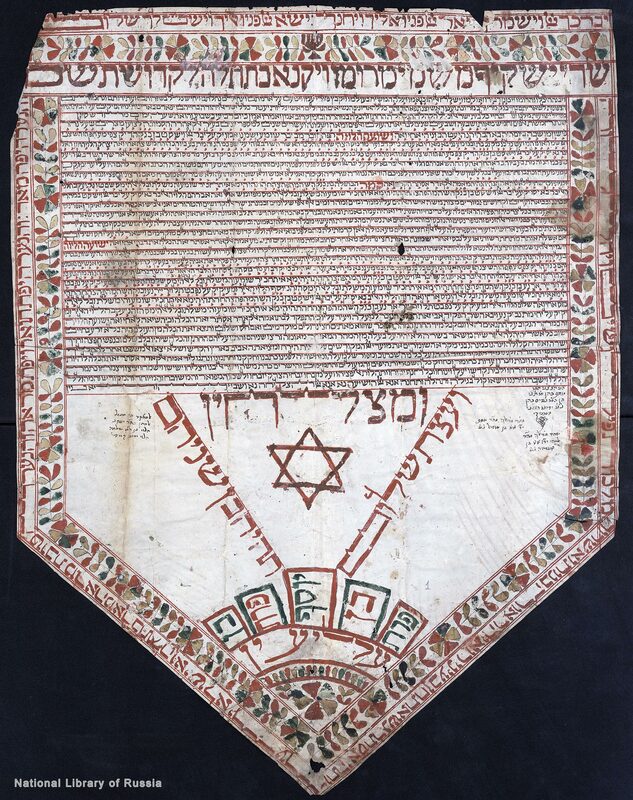 Marriage contract between the Karaite Joshu‘a ben Joseph ben Ele‘azar and Karima bat Solomon ben Moshe. Fragment (the right part of the document). AM (year after the creation of the world) /im7138 AG /1827 AD Cairo. Square hand script. Signatures of witnesses are in Arabic. 1 fol. Paper. 67,5 х46,5 cm. The document originally has the form of a pentagon. The parchment is ruled with red paint that is also used for the head and end lines. An ornamental pattern in the border frame are executed using red, yellow and green paints. The left part of the sheet is torn off (about a quarter of the sheet has been lost). Marriage contract between the Karaite Avraham ben Nesim ben Yekuti’el and Rachel bat David ben Moshe. 5597 AM (year after the creation of the world) /im7148 AG /1837 AD Cairo. Square hand script. Signatures of witnesses are in Arabic. 1 fol. Paper. 72,5 х56 cm. The parchment is ruled with red paint that is also used for the bottom line. Ornamental patterns in the border frame and in the bottom corner - cone are executed using red and green paints. The upper edge of the sheet is torn off. Marriage contract between Moshe … and Rachel bat … ben Ephraim. 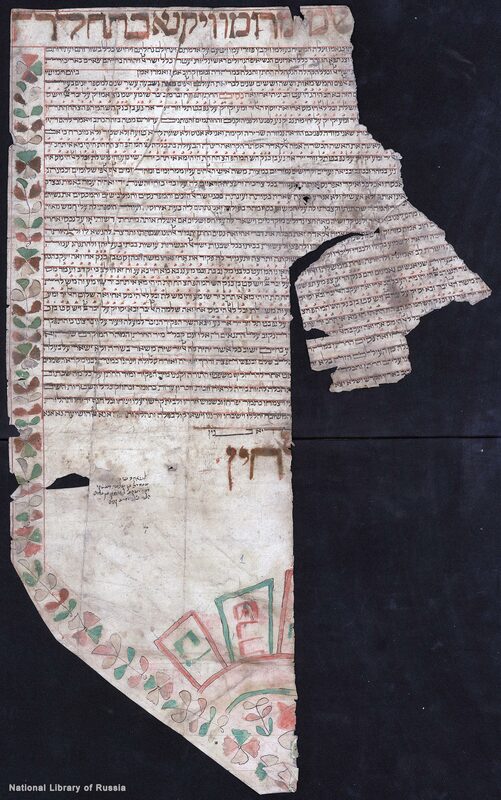 Fragment (the right lower part). [the first third of the 19th cent., Cairo]. Scribe Joseph Kohen ben Nesim Kohen Dimashqi. Square hand script. Signatures of witnesses are in Arabic. 1 fol. Paper. 39,5 х37 cm. Ruled using red ink. An ornamental frame in the right side are executed using red, green and yellow paints. 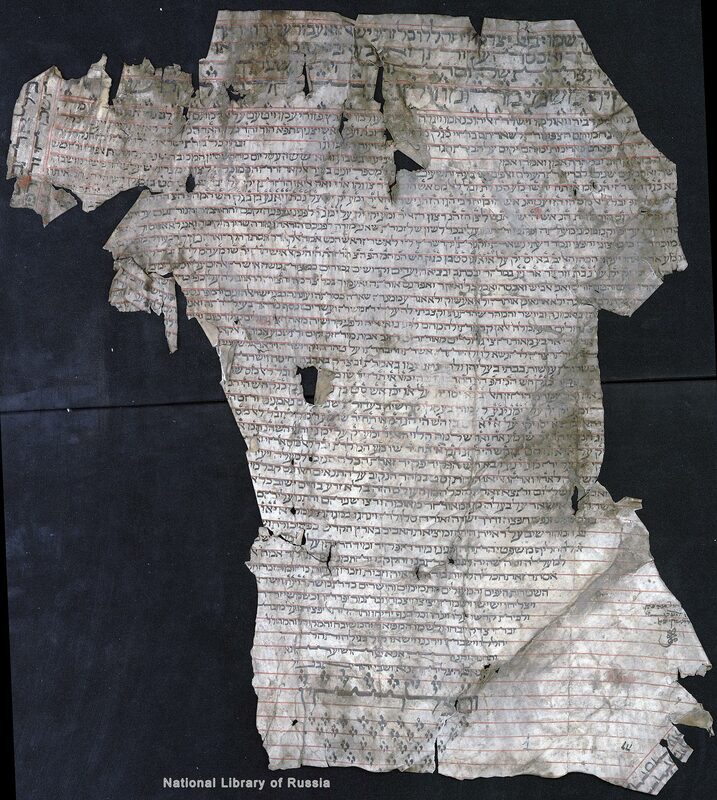 The upper and left parts of the sheet are torn off (about a quarter of the text have remained). The lower edge of the sheet is damaged. 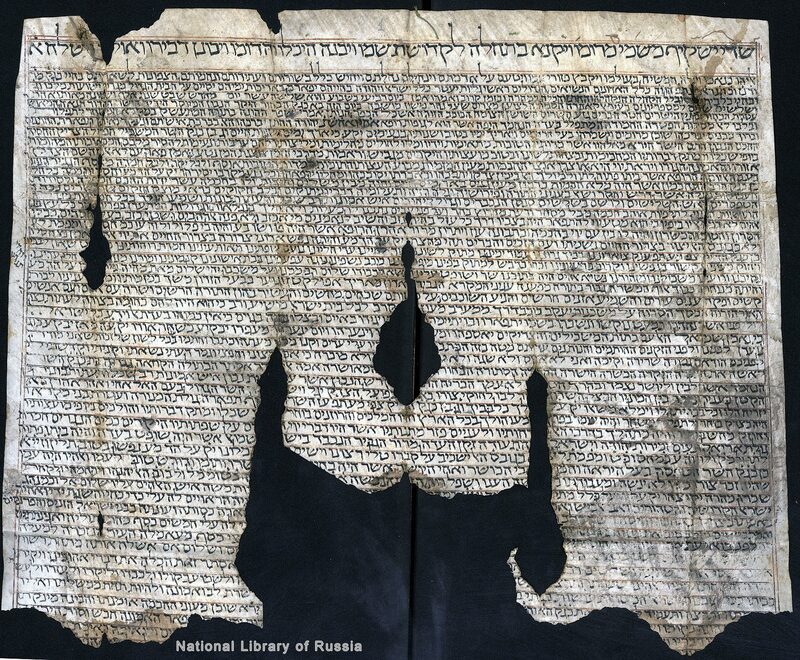 Marriage contract between Isaac ha-Levi and the Karaite Jamila. Fragment. Without date. Cairo. Archaic square hand script. 1 fol. 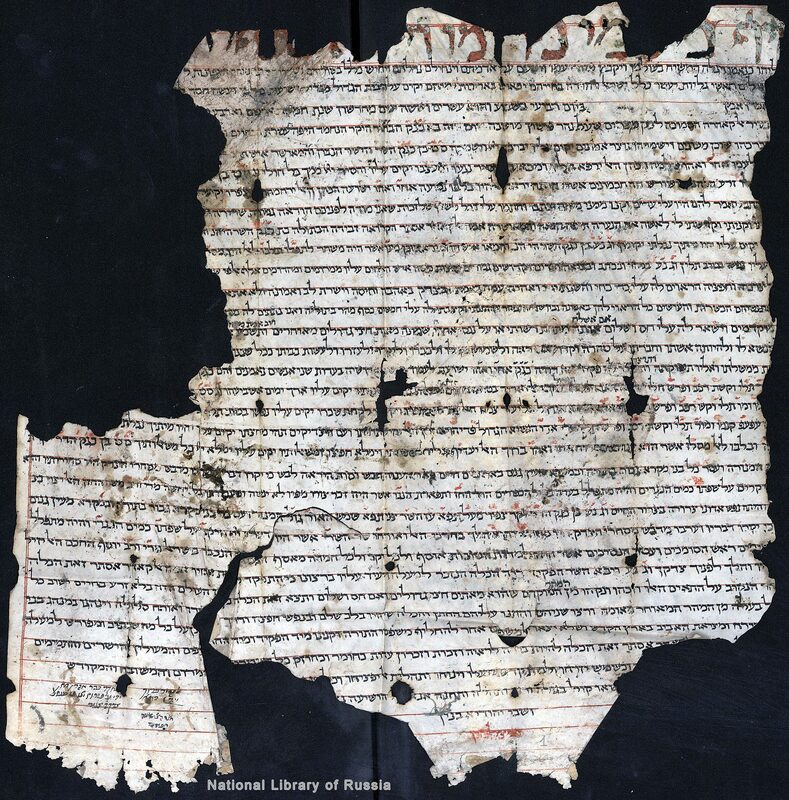 (composed of three fragments). Parchment. 49,5 х30,5 cm. Ruled using red ink. There is significant loss along the edges and in the center of the sheet, the dirty spots on the text. Marriage contract between the Karaite Solomon ha-Nasi ben Eliyahu ha-Nasi ben Zephaniah ha-Nasi and Rachel bat Ja‘cob ha-Levi ben Solomon ha-Levi. 5610 AM (year after the creation of the world) /im7160 AG /1849 AD Cairo. Square hand script. 1 fol. Paper. 35 х49,2 cm. The parchment is ruled with red paint, the head line is also written in red. The document is decorated with a floral ornamental frame executed using red and green paints. Marriage contract between Ezekiel ben Ezra and Maryam bat Moshe. In Hebrew and Aramaic. 5611 AM (year after the creation of the world) /1851 AD ), Calcutta. Sephardic hand script. The upper part of the text, the anthem, the names of the bride and groom and the sums of money are written in larger, square handwriting. 1 fol. Parchment. 66,5 х41,3 cm. The parchment is ruled using black ink. The contract is decorated with a gilded frame, in the fields and in the center of the top is an ornate floral pattern executed using pink-burgundy and dark green paints; two tigers are painted in orange at the top, and two gold fish are depicted directly over the text of the contract. 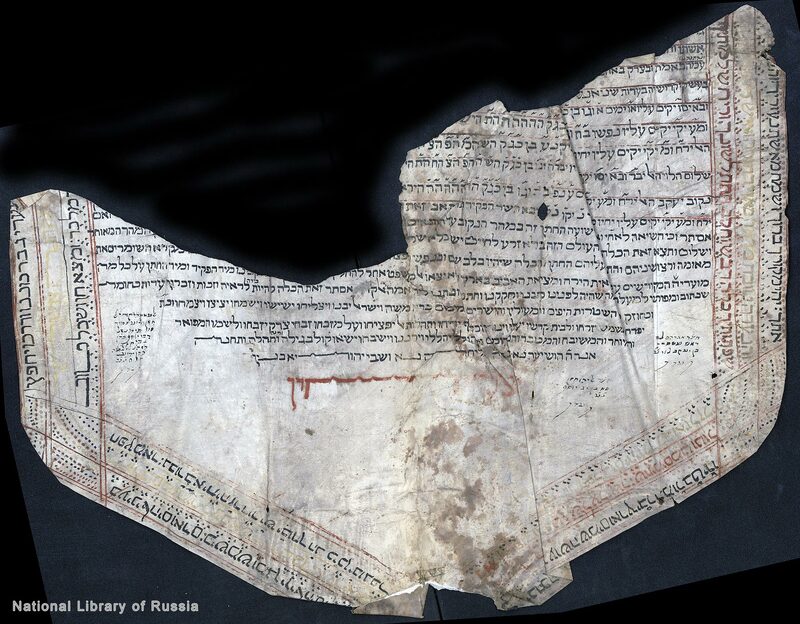 Published in: Ornament drevneevrejskih rukopisej / RNB (Ornamentation in Hebrew manuscripts / NLR); compilers are O. Vasilieva, B. Zaikovsky and A. Kantsedikas. Moscow; Tel Aviv, 2003. Illustration 157; Jakerson S. M. Evrejskie sokrovishha Peterburga: svitki, kodeksy, dokumenty (Hebrew treasures of St. Petersburg: scrolls, codices, documents). SPb, 2008. С. 230–231.